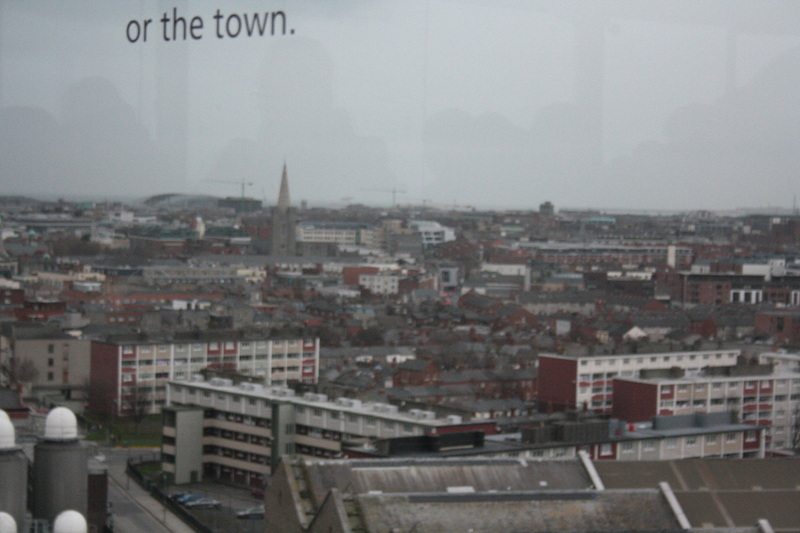 of Dublin from the Guinness Storehouse Gravity Bar. At 9:30am we left our Glen Cove B&B, navigated over the short bent bridge and began our drive of about 300 km. from Ennis to Dublin. Our waiter the evening before expressed his disgust at to how this nothing village in Ireland had disgraced itself purely through a tourism opportunity. Apparently a genealogist discovered that Obama had a great-great-great-grandfather named Falmouth Kearney who once lived in this very village named Moneygall. He was disgusted how this village had taken advantage of this and built a lucrative tourist business around this sudden reality. Obama-mania broke out. Obama T-shirts, Obama Cafe's and the rest was history. Then when he discovered we were traveling to Dublin the next day, he realized we'd be driving right past this very village! It was hilarious how quickly he changed his tune and began insisting we had to stop in and see the place. We were amused at his sudden change of heart. Unfortunately, we were scheduled to see places in Dublin we'd paid for so we did not have time to stop in and do Moneygall justice. We had a pre-paid voucher and so were invited right inside to a short line-up in the warmth! 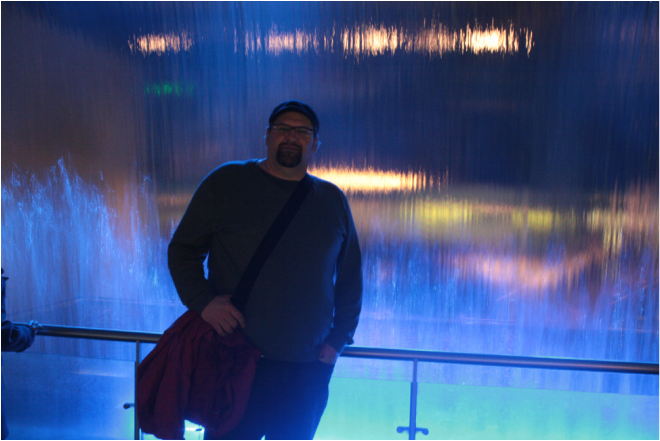 Larry stands before a blue waterfall. 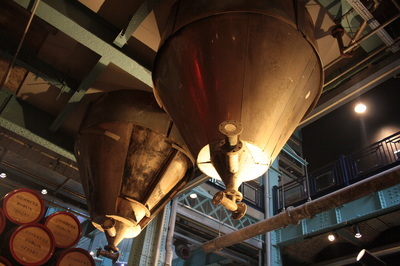 The point being how pure water is a very important element of guinness's success. The Guinness Storehouse was where beer was first made but has been turned into a tourist center explaining the history and method of making each pint. For this purpose the plant has been transformed into the shape of a giant pint of Guinness, that if full would hold 14.3 million pints! The tour begins at the bottom of the glass and works it's way up to the foam or "head" of the glass of Guinness. The Master Brewer will guide you through each stage, going up through each of the seven floors of the glass to the very top. Let me highlight some unique things about the tour. First, it is very high tech, the master brewer illustrating the process via videos all the way up. Also, there is a display of all the famous people who have visited the place. 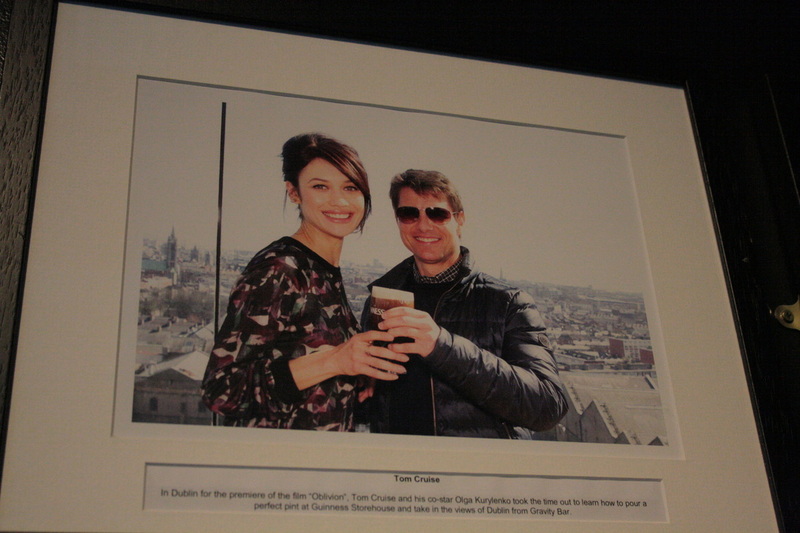 Above right is Tom Cruse's photo having a Guinness. The other thing is the creative advertising the company engaged in. On the left you see an example. The final unique aspect of the Guinness plant is that Arthur Guinness founder of the Guinness brewery, signed a lease that would never happen today. It can be viewed on the main floor and you can see the signature and the date, it was a 9000 year lease signed Dec. 31, 1759 for an annual rent of 45 Pounds. Amazing! This signature is still copied on every label of bottled Guinness. you ought to feel without beer." It is Feb. 27th and we have just left the Cliff's of Mohr. 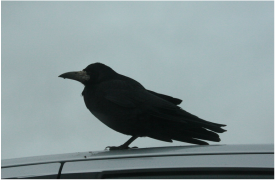 There was a bird on the roof of our neighboring car in the parking lot, who would not fly away. Stayed there even as I walked between his car and ours to enter our car. Weird. I immediately considered this a photo opportunity. When will a bird pose for you 4 feet away? So, I sat there holding up our departure hoping to get a "bird with spread wings" shot, but he refused to co-operate. He would not spread his wings for me even to fly away. I began to try to encourage him, you know, keep my camera poised while I began asking him what was up. "Like, hey your Irish, where's the sparkling Irish eyes? At least make a few modeling moves eh?" But there was no sparkling eyes or tapping toes here. I began to wonder if it wasn't the weather, overcast, windy, cold, threatening to rain, I concluded he was probably depressed. Weather can get you down you know. Then I had it, it's a "guy" bird! It's spring here in Ireland and began to realize it's a dating problem he's mulling over. He was thinking about starting a family. That's it, he was totally distracted thinking about his next move with that special lady bird! There would be tough competition for sure....always is...probably tired from the first go-round and now getting "centered" for the next approach to the whole situation. Well, we would have to leave him alone...this was important and being a guy, he couldn't multi-task and do a modeling routine for me at a time like this. I turned to Larry at the steering wheel and suggested we get going and leave the poor guy-bird alone. He was busy for sure. As we moved out of the parking lot, I looked back in sympathy...he had a hard road ahead. "Good luck my friend, there is an maid with smiling Irish eyes out there somewhere, go for it buddy." The plan was to go back to Ennis on a different route we'd taken coming to the Cliff's of Mhor. 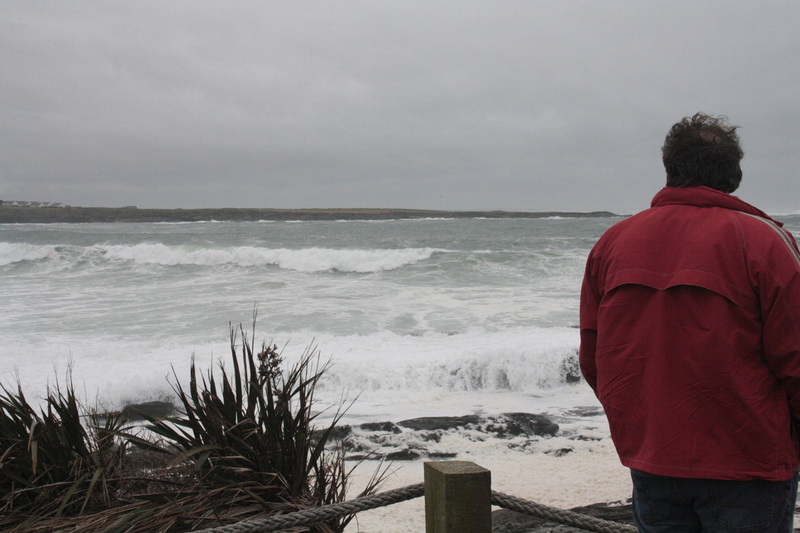 We decided to go south along the west cast towards Milltown Malbay, just to enjoy the coastal sites. We came across Spanish Point and were drawn towards it when we saw the tumultuous breakwater crashing in on the shore line. We turned in and took the pictures you see above. 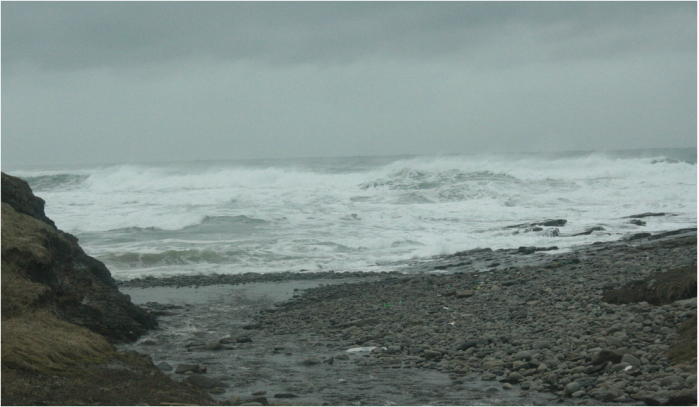 Again the violence of the ocean accompanied by it's roar was overwhelming. We spoke of the oceans rising and shuddered to think how little it would take for this point and all it's homes to be over-run with a rising ocean tide. From there we turned back east on highway R474 returning to Ennis. 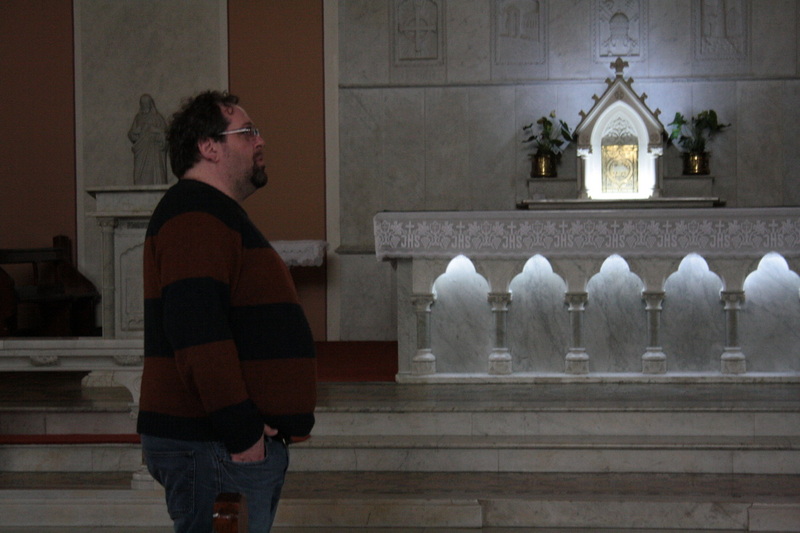 In the town of Connolly we ran across another church, "St. Michaels" and tried the front door. It also was open but had a sign asking us not to enter the sanctuary. This we respected, took the photos you see above and left. We had kind of hoped for another warm spiritual experience we'd had before, but it was not to be. When we got to Ennis we found the "Fransician Frier" area of the city. 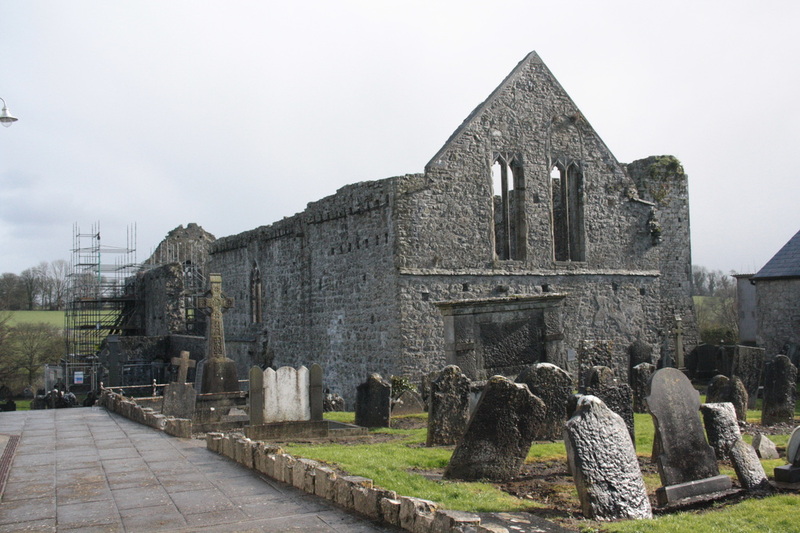 Here is a quote from their website: "Founded around 1284, Ennis friary had a flourishing school in 1441; with the Reformation and the suppression of religious houses, the final expulsion of the friars came in 1693. In 1766 there was no community here, but eight friars were working in the district. "St Francis, it was said, 'walked this earth as the Pardon of God.' Immersed in God's healing goodness he radiated mercy and forgiveness. And he constantly echoes the teachings of Jesus on the necessity of cleansing our hearts of all resentment, bitterness, and of the desire for revenge. 'Since you speak of peace, all the more so should you have peace in your hearts.' "
We enjoyed the museum. 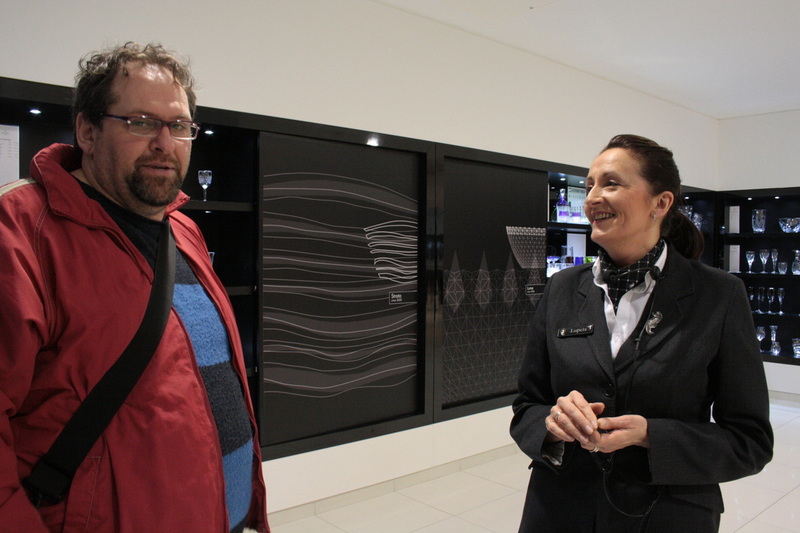 The two clerks at reception were jovial and couriouse about us and where we were from. We learned that the building had a long history and was formerly St Xavier's School and Chapel, The museum galleries with its exhibition opened to public in October 2000. 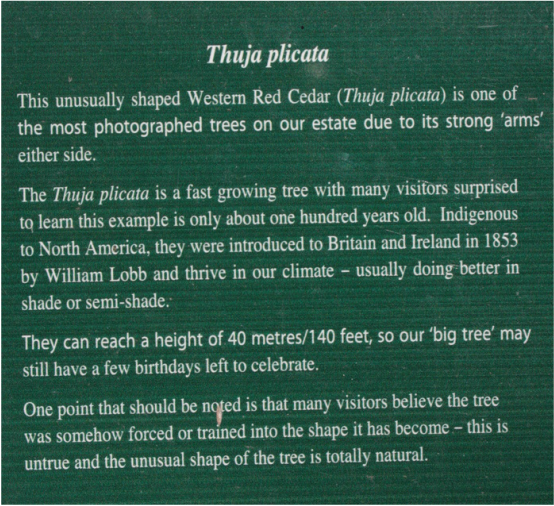 The Riches of Clare - its people, places, treasures - occupied two galleries. 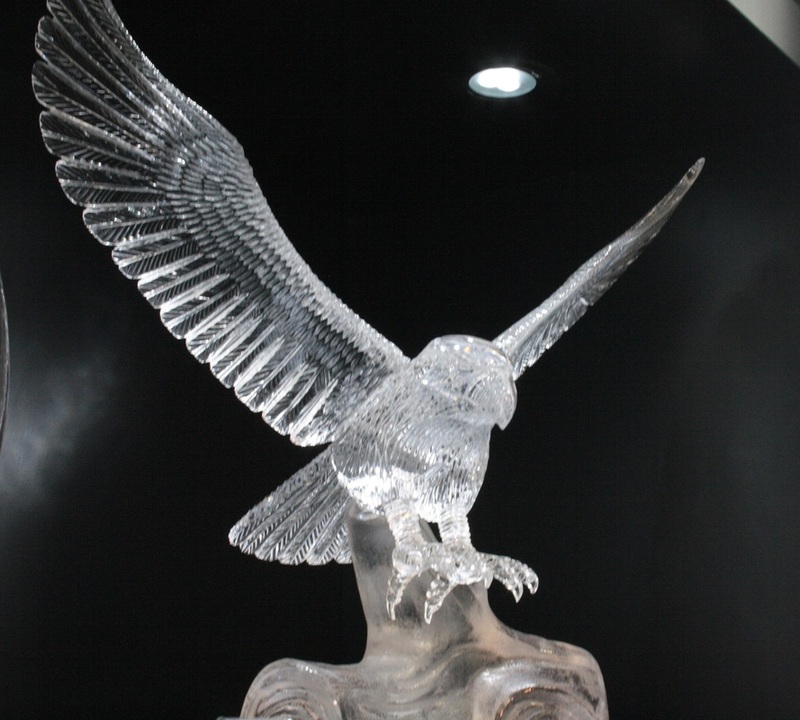 The concept of the exhibition was thematic, focusing on the lives and experiences of the people of Clare through the themes of Earth, Power, Faith, Water and Energy. It had been a long day and we were hungry. We walked up the street and entered the first pub we saw, it was just opening so we got our drinks and waited. After an hour or so we realized this was a "drinks only" pub. After a lively conversation, where the bar-tender explained, "We don't serve food but we do serve excellent drinks!" We were then directed to another pub "Cruises" which we were told served excellent food. They were right. Here we are, food ordered and ready to eat. 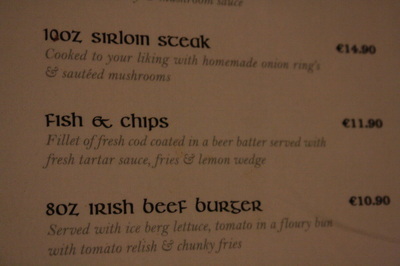 Above are the pages from the menu with Euro prices. 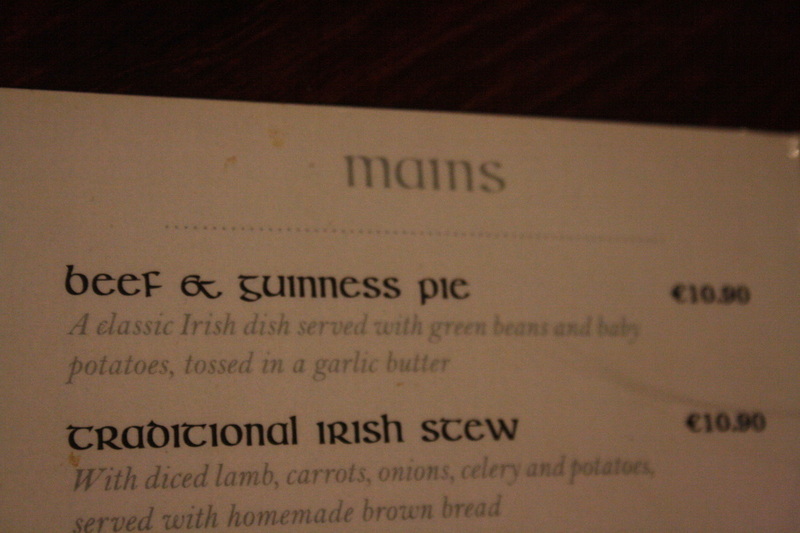 I had the traditional Irish stew. 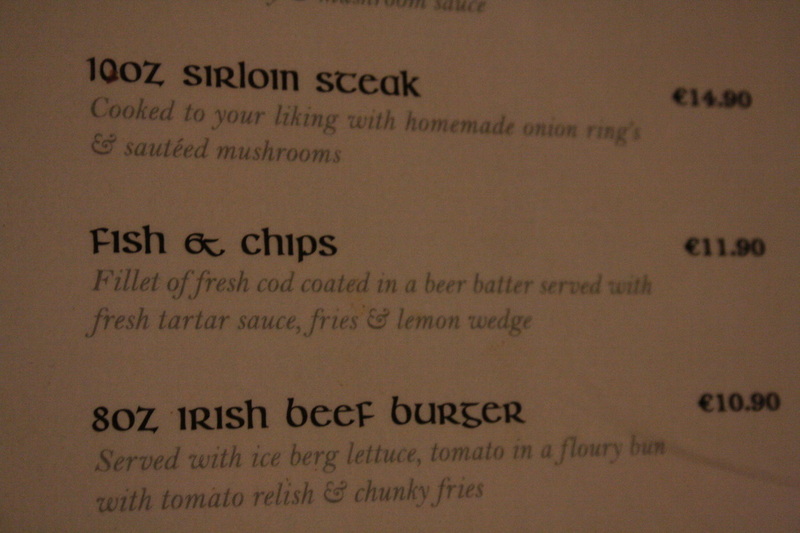 I forget what Larry ordered, it was either the steak or the fish and chips. Regardless, the food was fantastic. 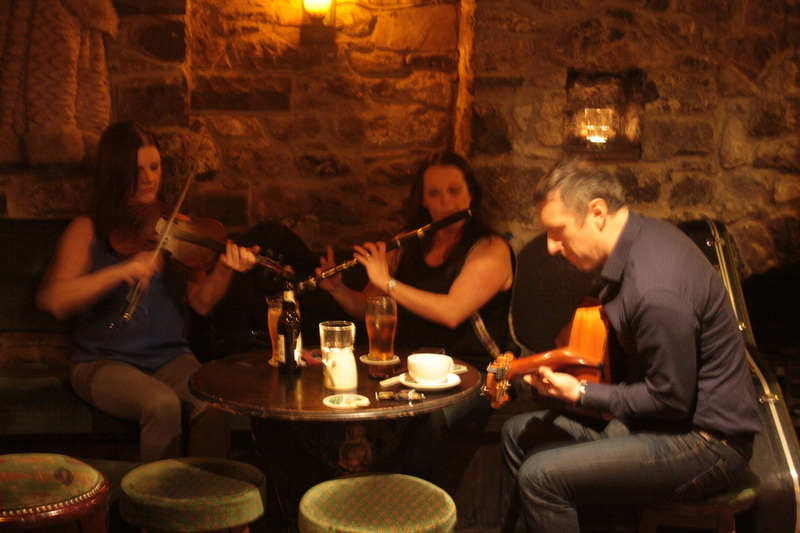 Since there was to be live music later that evening, we were moved to another room alongside a fireplace where we had our desert as we enjoyed a concert of live Irish music. Below, are two pictures, our place at the fireplace and then the music group. It had been a great day. 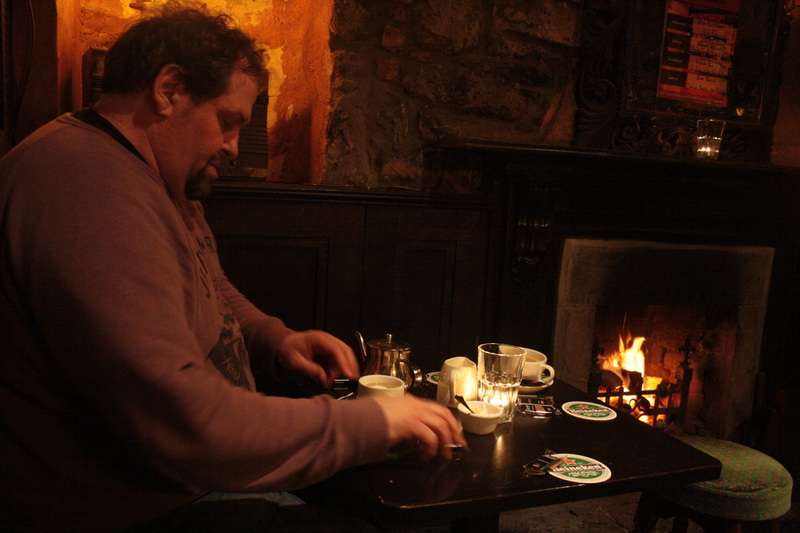 This would be our second last night in Ireland. That evening, I thought about home, then I remembered the Irish Guy Bird! I wondered how he was doing and again wished all good things for my feathered friend. but He does not throw it into his nest." That Ocean is Not Silent! After we finished our breakfast at the B&B we once again encountered this strange and unique bridge. 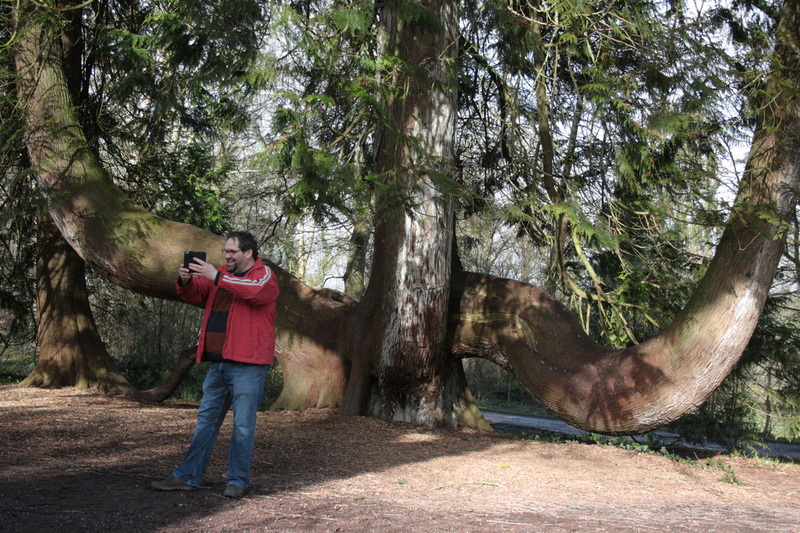 It's one of this unique strange things you find in Ireland, which make you stop and wonder, why? This was one of them. Here's the thing...the bridge is no a side-road. It is short, narrow and to make it just a little more complicated, it's sharply curved. By "narrow" I mean only one car can pass at a time. So you must always check to see that you are the only one on it for if you meet someone, one of you has to back up off the bridge to let the oncoming car pass. Add to that the curve which makes it a concern for any vehicle but especially for anyone with a longer truck or trailer behind a vehicle. You really have to make sure you don't scratch your trailer on one of these unforgiving sides. We asked a resident about this but he was as confused as we were, and he was Irish. I tried to be helpful, asking if it was really an expensive speed bump. But, no, that did not seem to be it. So, it's just one of the many unique, mysterious and cute things one has to accept as simply Irish. 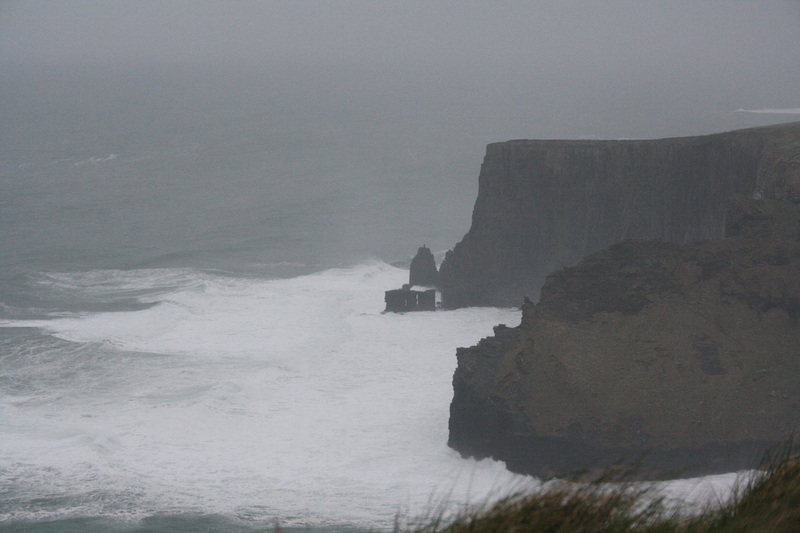 After we had dealt with that, we made our way west to the Atlantic coast on N85. Once you get closer to the coast signs will lead you the rest of the way. After passing on our voucher we parked our car and got ourselves ready to face the cool temperature and strong wind battering the coast, donning our hoodies etc. I should have taken my gloves, as they got pretty cold and hid in my jacket pockets the whole time. 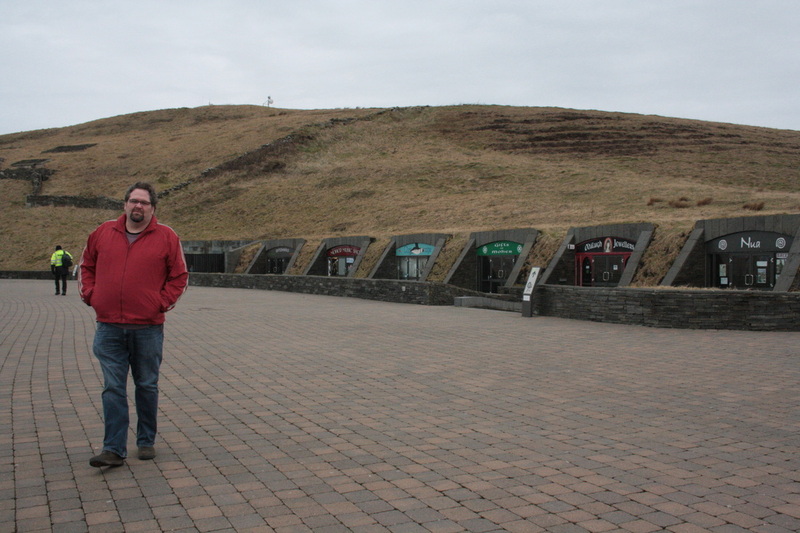 Here we are walking past all the tourist shops built into the side of the hill. Notice, Larry's hands are already in his pockets! When you looked at the signs there seemed to be quite a play on my name, "Cliff's Exhibition", "Cliff's Coastal Trail," "Cliff's of ..." Anyway, gives one kind of a warm feeling. 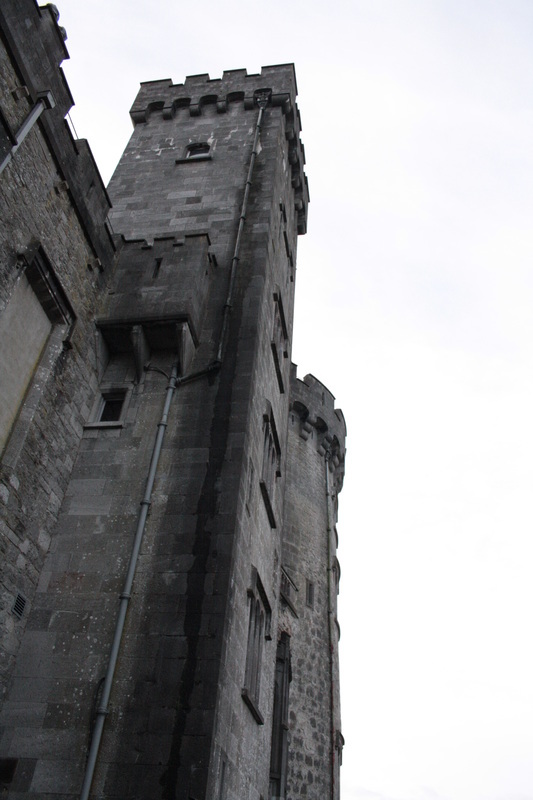 On our way we went first to the viewing tower built in 1835 called O'Brian's Tower. First, below, I will show you the view along the coast to the North. Then, below and the photo at the very of the blog is a view to the south. The most compelling and impacting thing about these cliffs is the overwhelming constant enveloping roar and power of the Atlantic Ocean. It stays with you where-ever you go near the cliffs. Rising slowly from Doolin they ascend to over 700 feet (213 metres) stretching south for nearly five miles (8km) to Hags head. 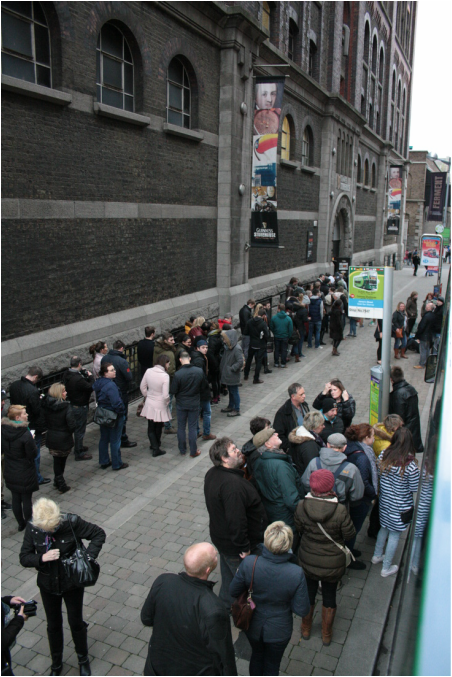 They are Irelands premier tourist attraction and a dramatic must see for anyone visiting Ireland. In the distance is a rock "stack" or "chimney" near the cliff's. I walked south along the top of the cliff to just past that point and took the photo below back towards where I took this one. 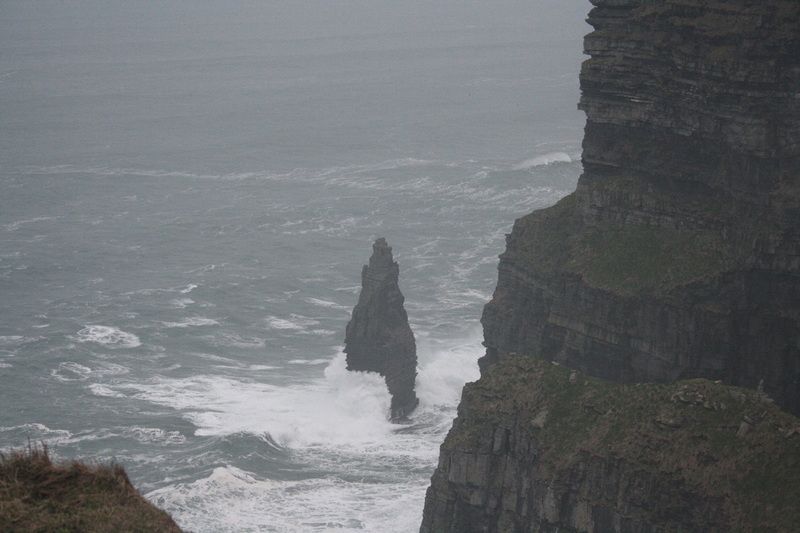 The cliffs take their name from an old fort called Moher that once stood on Hag's Head, the southernmost point of the cliffs. 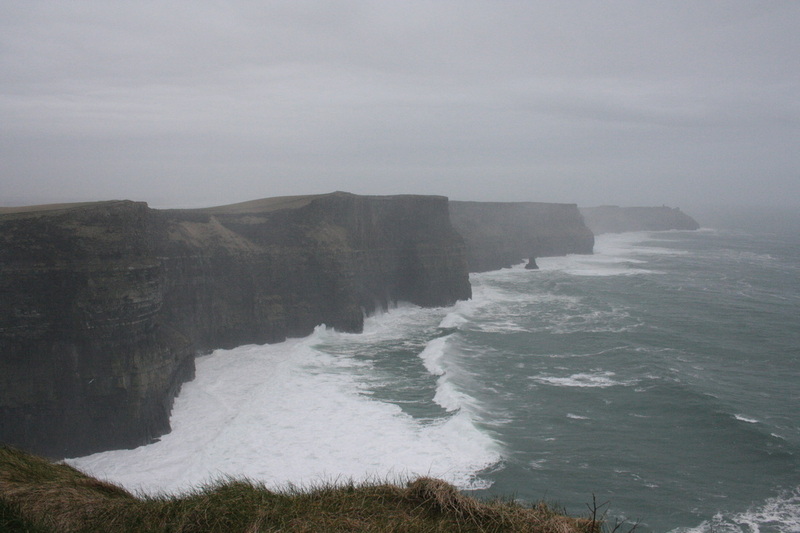 The cliffs are one of the most popular tourist destinations in Ireland, in fact according to records they had almost one million visitors in 2006. 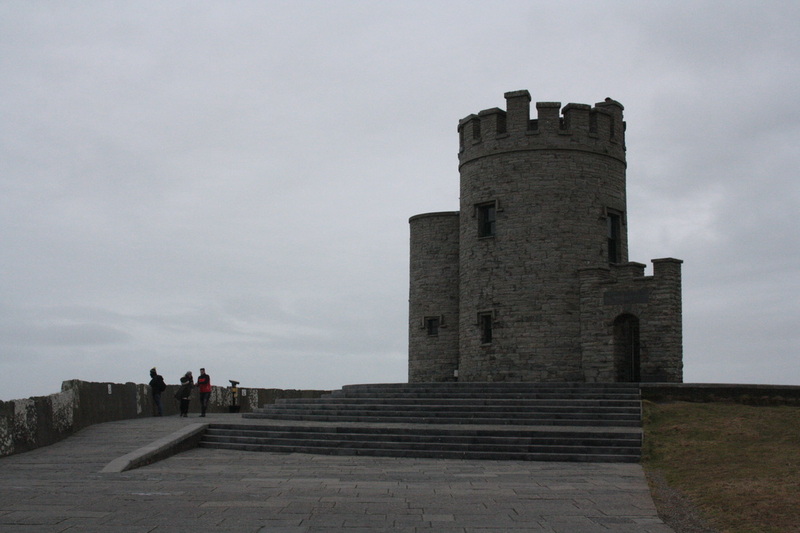 The Cliffs of Moher have appeared in numerous media. 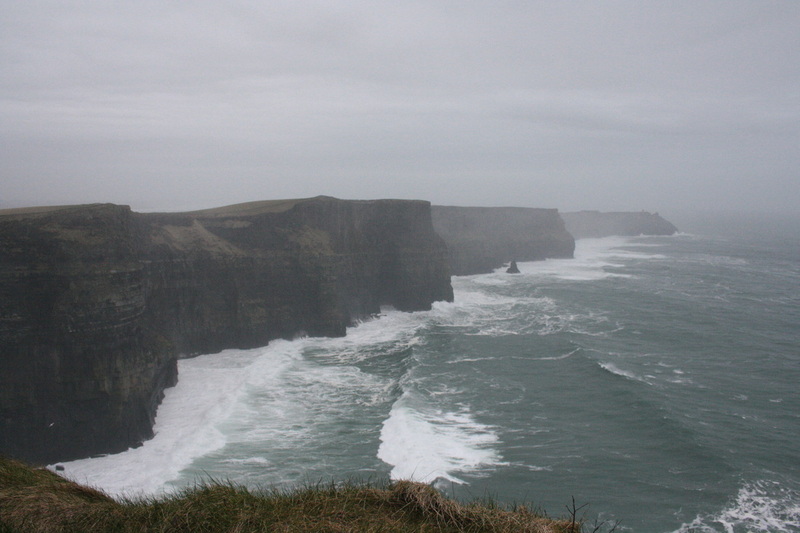 In cinema, the cliffs have appeared in several films, including The Princess Bride (1987) (as the filming location for "The Cliffs of Insanity"), Harry Potter and the Half-Blood Prince (2009), and Leap Year (2010). The cliffs are mentioned in the Martin Scorsese film Bringing Out the Dead (1999), and are noted in the 2008 documentary Waveriders as the location of a large surfing wave known as "Aileens"
We were very impressed with the exciting interpretive centre. Housed at the centre of the underground building this huge domed cave contains: a movie theater, images, exhibits, displays, food & experiences that will delight young and old alike. 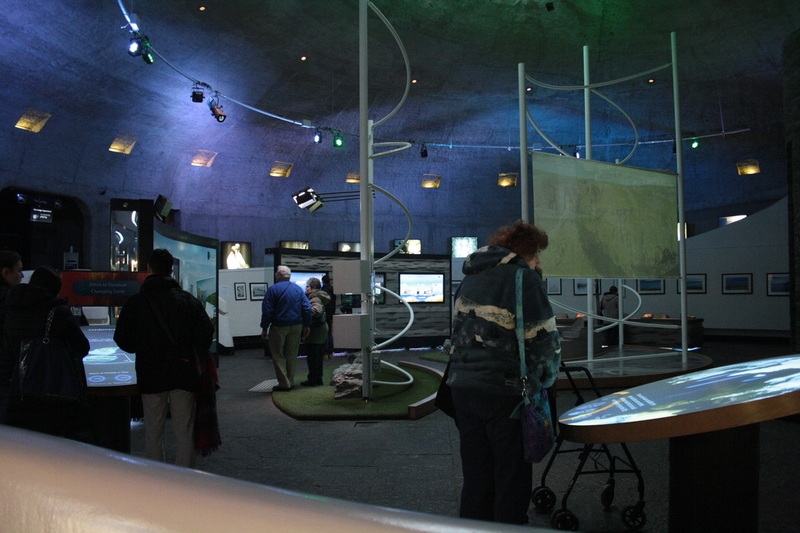 Visitors enter via a viewing ramp which provides access for all to the main dome. It was a fantastic visit reminding me, a prairie boy of the power and wonder of our "ocean" aspect of our world. ruffled, or mountainous; that ocean is not silent." 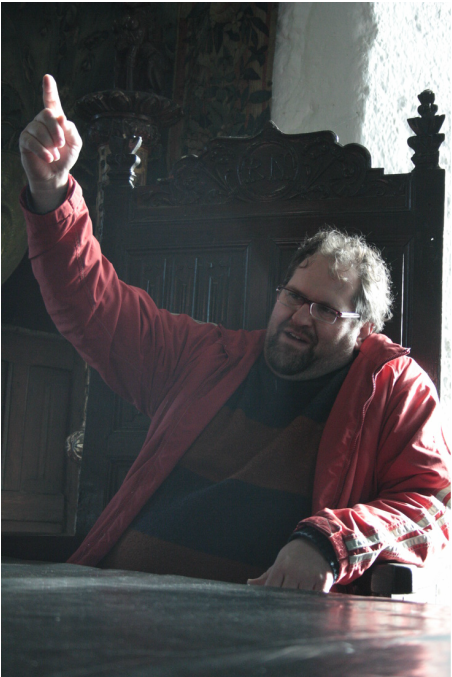 "﻿Long Live Larry, Earl of Bunratty Castle!" 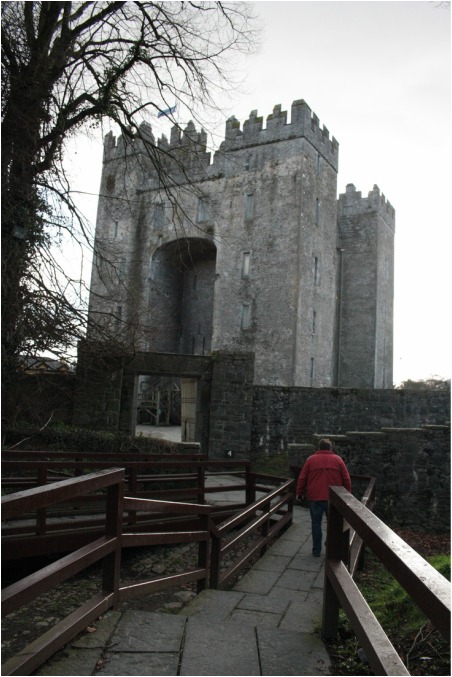 Bunratty Castle, located off N18 just before and N. of Shannon. There are great signs on N18 leading you to the site. "Not another castle!" you say! 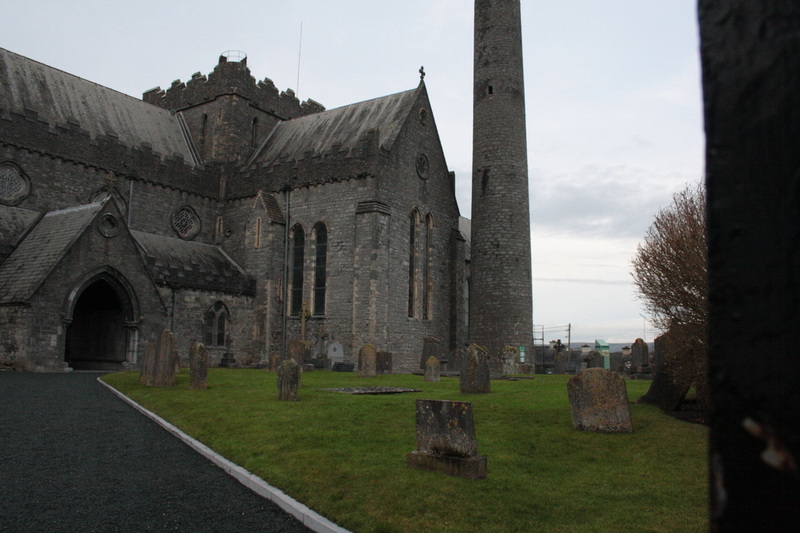 I know, there are a lot of these in Ireland but this is the last one we visited. But we loved it. There are actually several unique things about this castle that made it interesting for us. First, it's built in 1425 and many of the furnishings in the castle are from that period. I could not stop taking photos of the richly carved surfaces. No one makes this kind of stuff anymore. 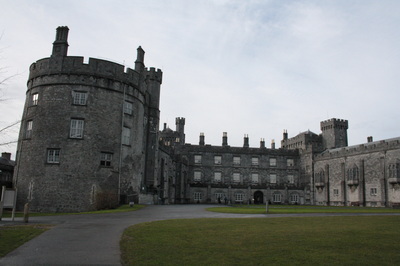 Secondly, the style of the castle was unique. There are four towers in a square soaring over six center stories. The basement was the store-room and stable. 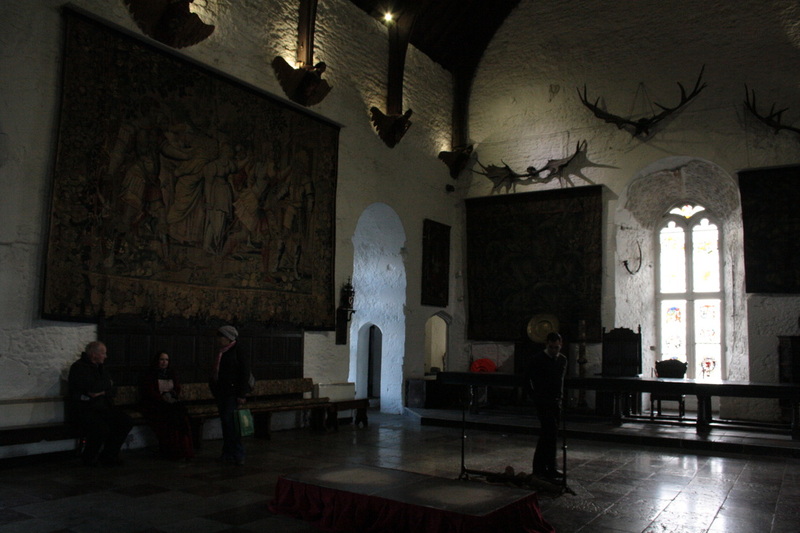 The second floor hall was for the area where the common soldiers and the Earl's retainers hung out. The third floor was the Earl's banqueting hall and audience chamber. 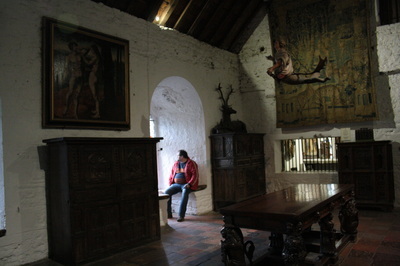 The walls were hung with interesting old French, Belgian and Flemish tapestries. 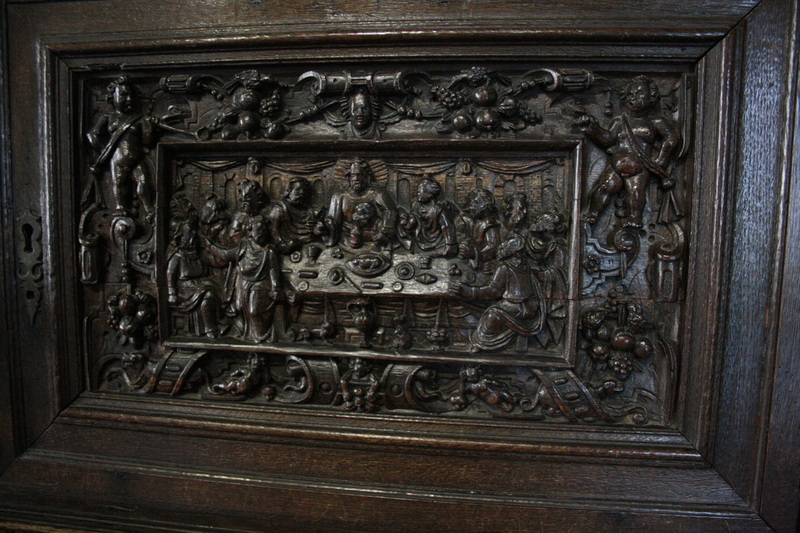 There is an oak cupboard dated from the 1570's. The kitchen was a room on the same level in one of the towers, with a large fireplace. 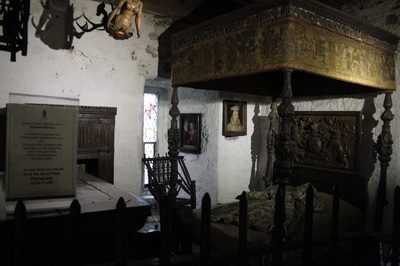 The Earl's bedroom was one floor up over the kitchen in the same tower. Must have kept his bedroom very warm. 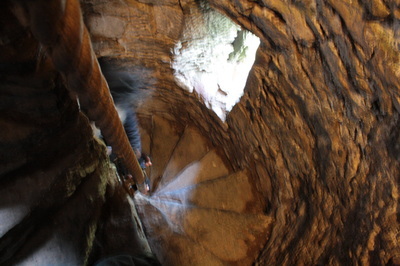 We wondered how he climbed the narrow stairs in his old age! 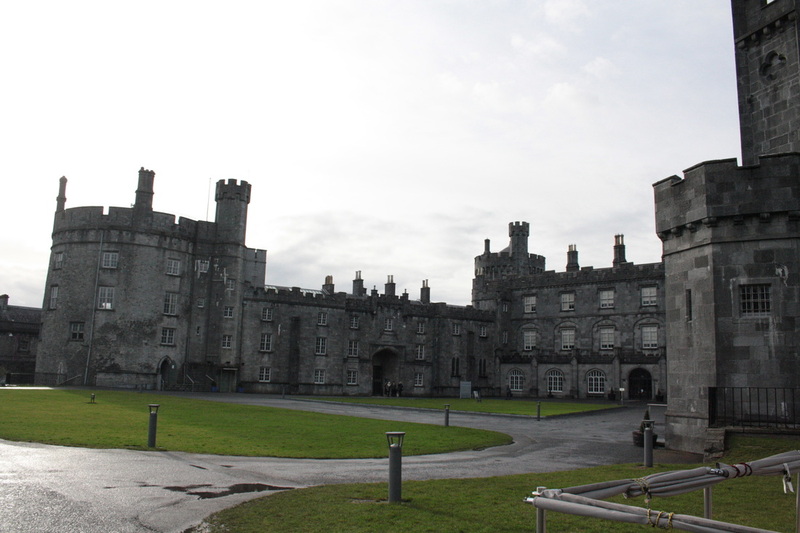 Third, the castle is located in what is called a "Folk Park" which simulates life in Ireland over a century ago. This includes a blacksmith, schoolhouse, weaver's shed, a pub and much more. Basically a village of the day. We did not have much time to tour this part as the castle was our priority. 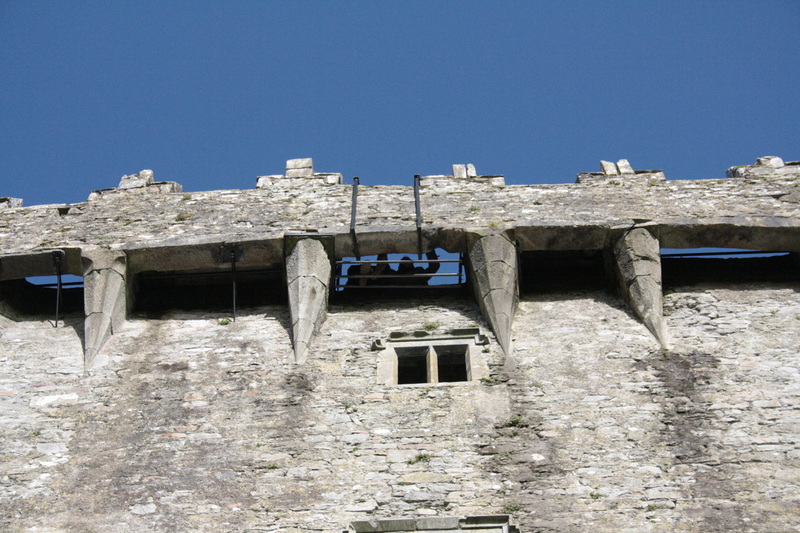 The photo on the lift above is a view of the second floor where the soldiers used to hang out. 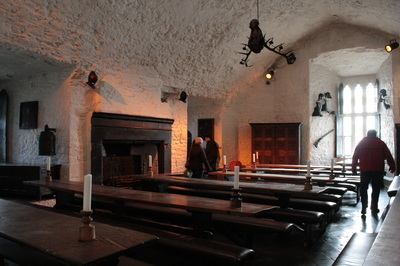 Now the world famous Bunratty Medieval banquets, take place here on a nightly basis. The Butler and ladies of the castle host an unforgettable evening of merriment, music and song accompanied by good food and flowing wine. We were ushered out at 4 pm to allow for the preparations to begin. On the right is the Earl's 3rd floor banquet room and receiving chamber. In the foreground center you see a small stage behind which is a fireplace in the middle of the room right in the floor. Must have been a pretty smoky place. 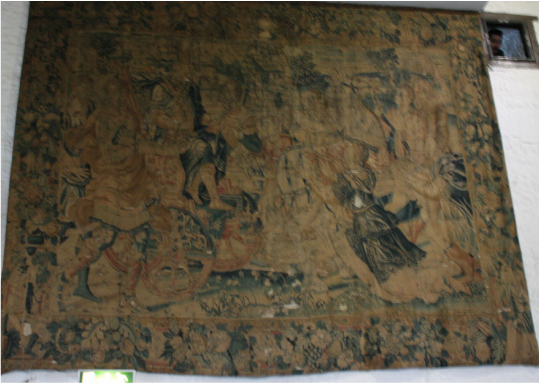 Below you see one of the tapestries that grace the walls of this room. This was an amazing carving done in the door of a large cupboard standing in the room. Above left is the private bedroom of the Earl. This is now on the third floor level. On the right Larry is sitting at the window of their private living room. 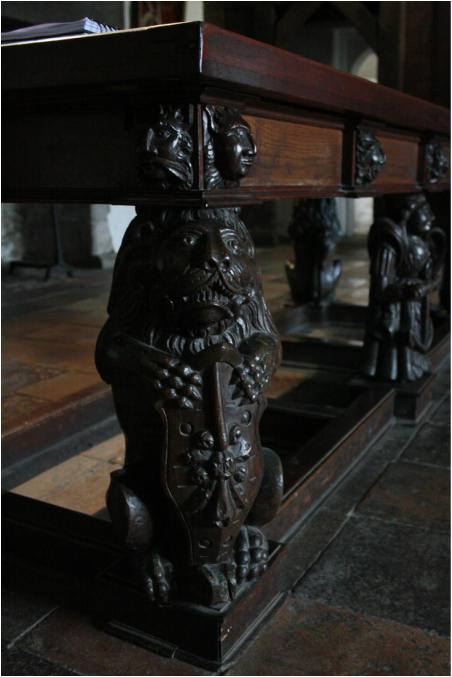 The main table you see is said to have been salvaged from the wreak of a Spanish Armada ship. Again you see tapestries, carvings and paintings everywhere. 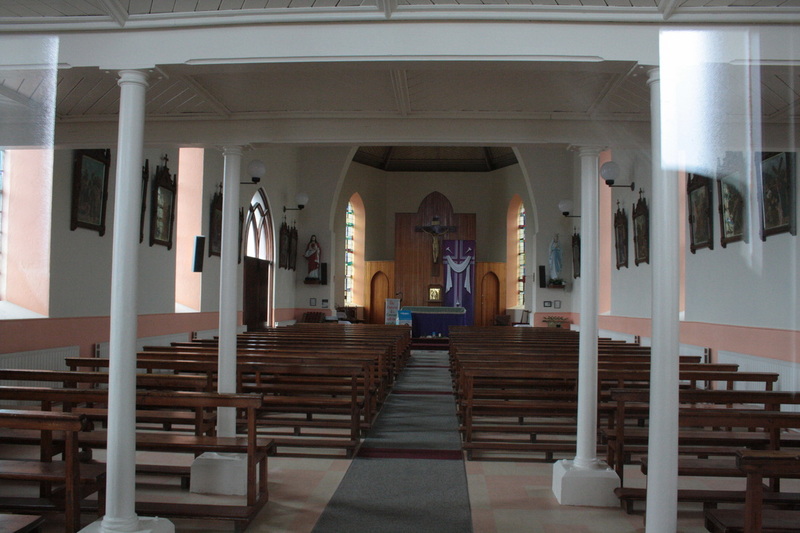 He had a private chapel adjoining. Below is a sample all the carving of the legs of the Spanish Armada ship. Each leg and center leg was a different and unique carving. Amazing. There must have been a lot of sculptors working for the kings, earls and landowners in those days. There were numerous other things to see like the captain of the guards room, the Priests room, the storage room, the earl's pantry, the dungeon, the business room called "The Robbing Room!". 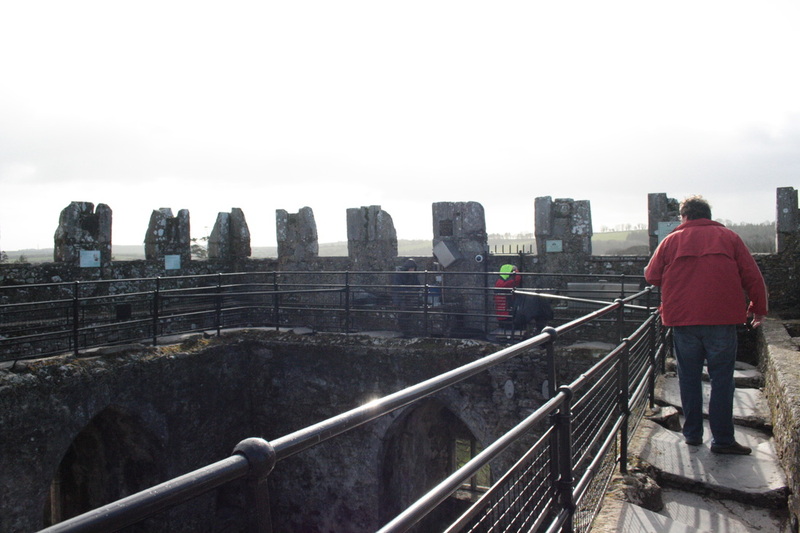 And of course we went to the very top of the castle gazing at the countryside from the top of the walls. One thing we became acutely aware of was the fact that there were no elevators in castles, not in the olden days nor unfortunatly in our day. Here is a sample of how we moved from floor to floor, bottom to top in this castle. And there were a lot of floors to cover, it is a very high castle! Not for the faint of leg! It was time to go. 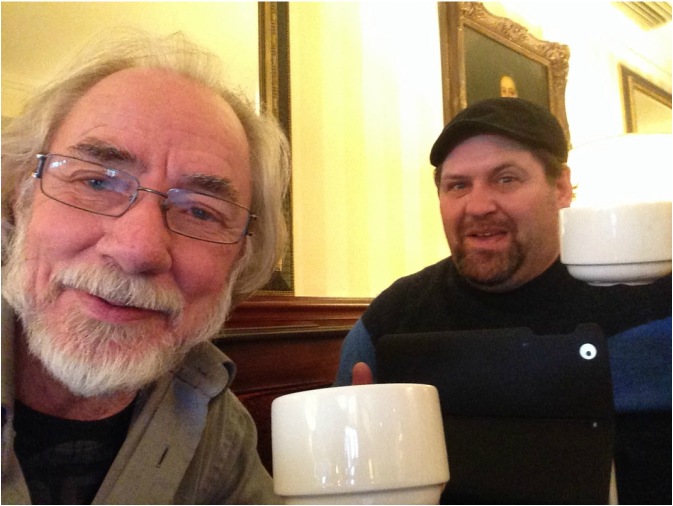 Before we left, Larry and I took turns sitting in the Earl's Receiving Room throne. Here Larry is making some kingly decisions and deceleration's for the nation. "LONG LIVE LARRY, EARL OF BURNATTY CASLE!" we built it out of sand. with turret, tall and grand. from which we'd sipped at lunch. 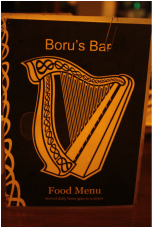 That evening we returned to Ennis for dinner at Boru's Bar and then to our Glen Cove House B&B at Ennis for the first to two nights. Tomorrow It's the Cliff's of Mohr. 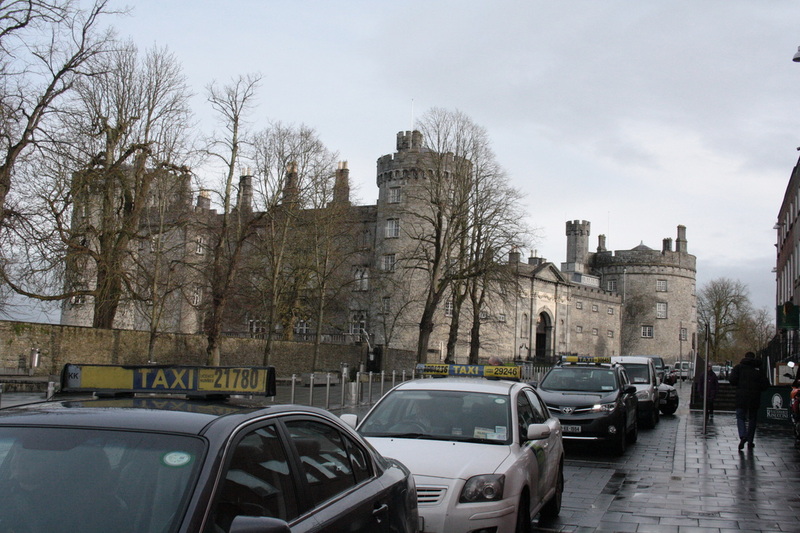 After purchasing gifts at the Blarney Castle gift shop we began our journey directly north to Limerick. The distance from Cork to Limerick is 101 km on highway N20. As we drive along we are always looking for interesting landscapes and potential places to see. 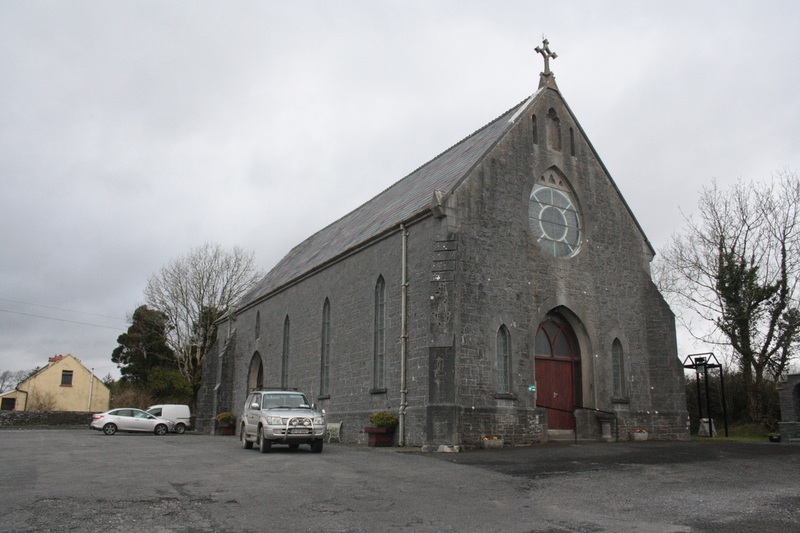 And at the town of Buttevant we found one. 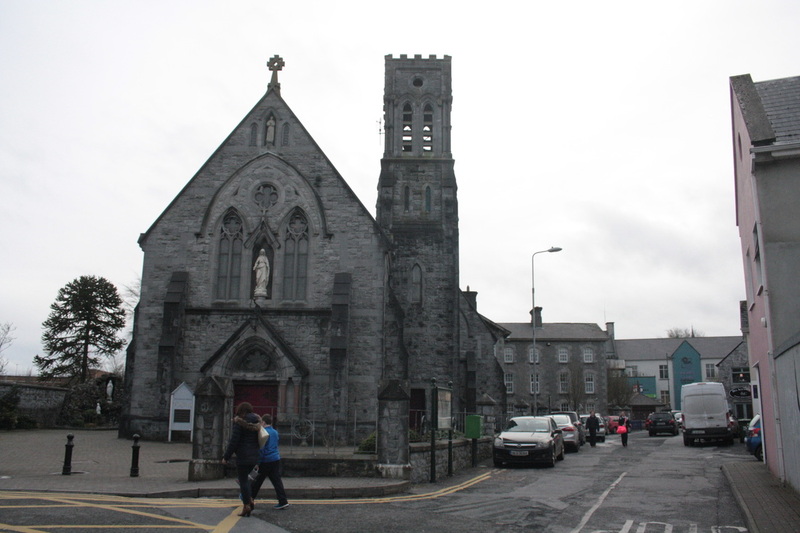 Every town or village we went through seemed to feature a large church at it's center. When we saw this one, we decided to stop and check it out. This is a sign we saw alongside the church. 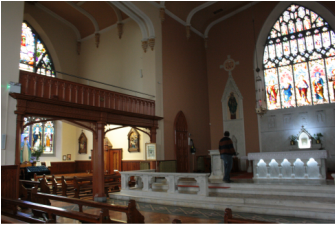 We entered the church through a side door, the quiet grandour of this sacred place welcomed and enveloped us. We moved to the "cross" section and stood in awe of the amazing windows depicting all around us the story of Christ and the gospel story. In reverence we gazed the impulse of worship welling up in our souls. Larry, a singing at heart began humming a hymn enjoying the wonder at the sound of notes echoing serenely through the whole of the sanctuary. 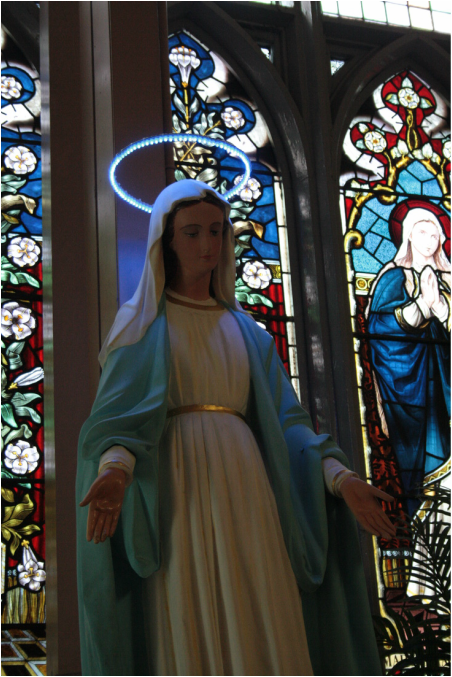 Then, launched into a rendition of Ave Maria in his operatic voice, echoing through every corner and expanse of the church. 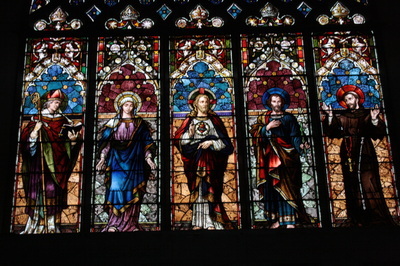 The music and the words of the scripture echoed throughout the empty space rising up in agreement with all the exquisite stained glass windows, in tribute and worship of our God. We stood in silence transfixed. I moved slowly down the Isle into lobby of the main entrance and exited the church, only to be surrounded by gravestones and the ruins of the same church form a much earlier time. 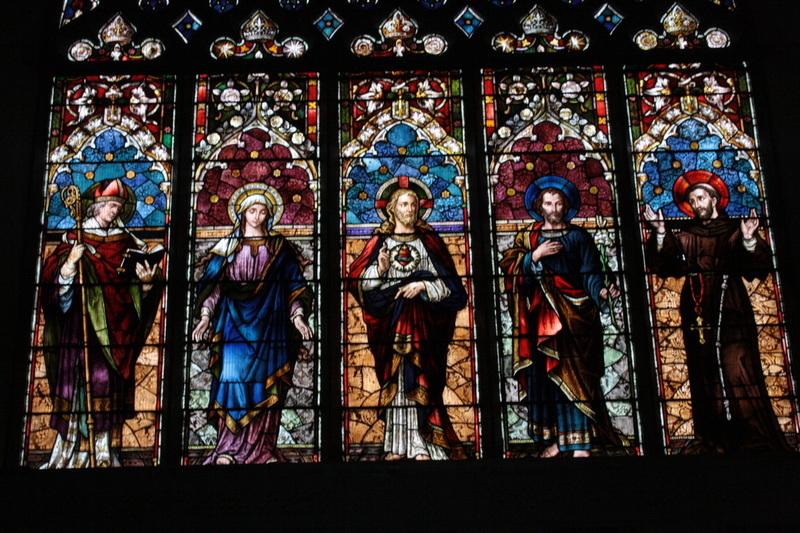 Here was a history of faith. bursting out on the grounds along the path to the castle. 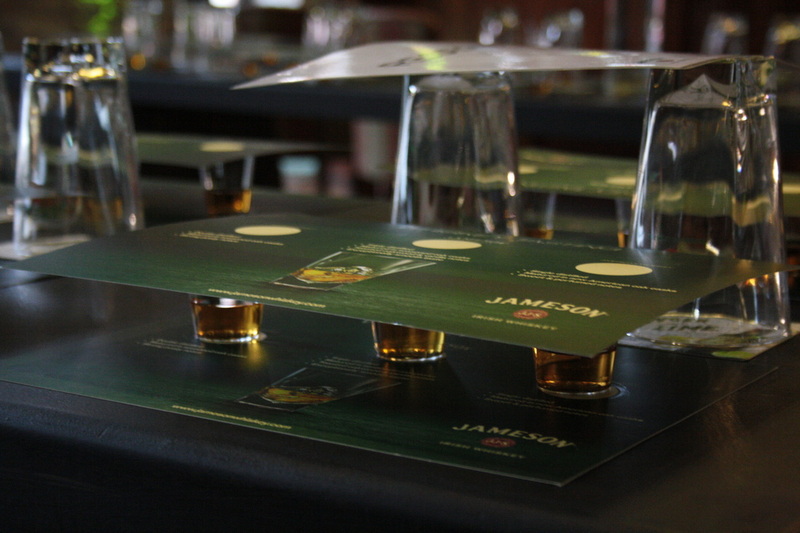 Ever heard the saying, "That's just a lot of blarney."? 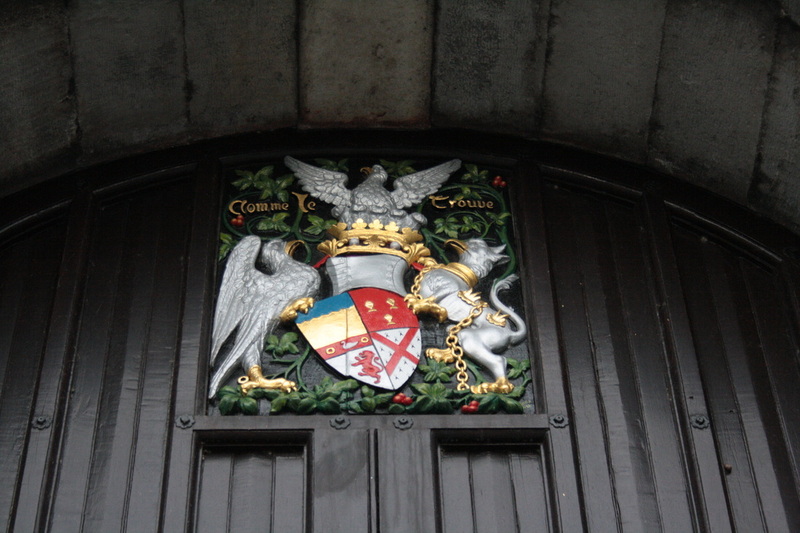 Well the story goes that the evasive McCarthy, Lord of Blarney, who was quizzed by the Earl of Locester, Queen Elisabeth 1's emissary regarding a dispute about land ownership, never got to the point. When the emissary reported the stalemate back to the queen she apparently blurted out, "But this is just more blarney!" According to Wikipedia, "...the current keep was built by the MacCarthy of Muskerry dynasty, a cadet branch of the Kings of Desmond, and dates from 1446. 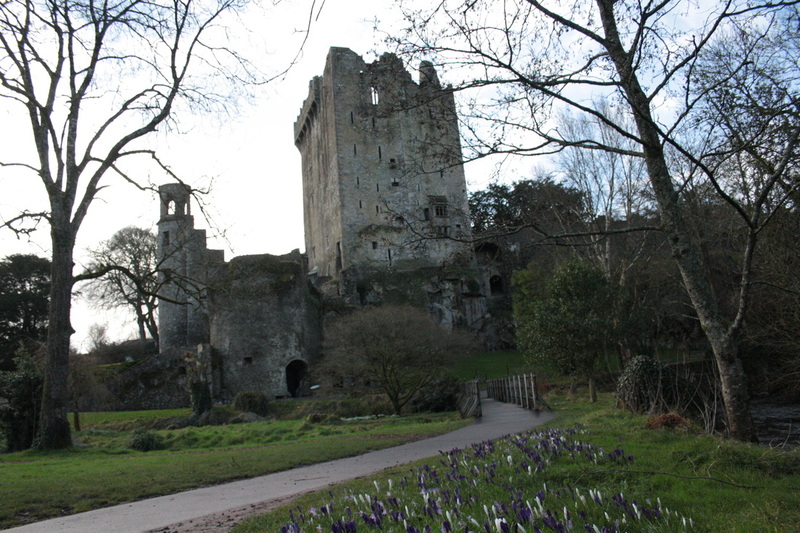 The noted Blarney Stone is found among the machicolations of the castle." Apparently, everyone knows that those who kiss the Blarney stone are magically endowed with with the gift of the gab! This stone kissing thing is one of Ireland's very popular activity for both tourists and the residents of the Island. 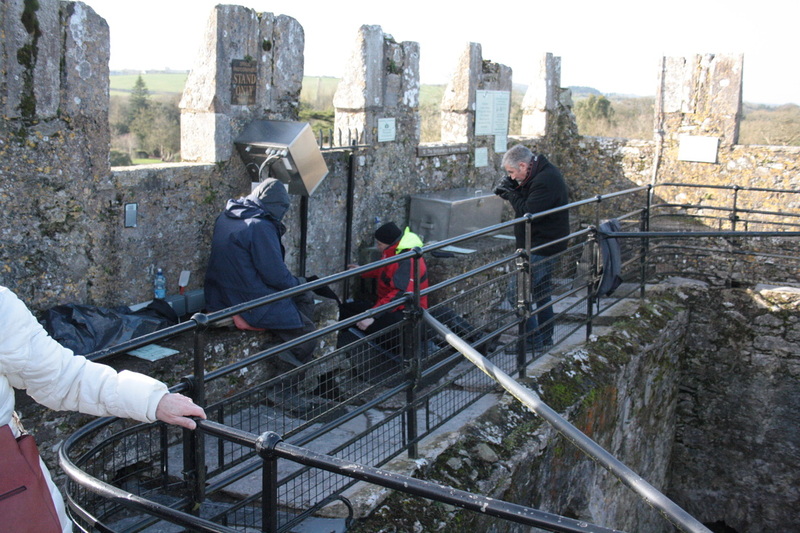 We were encouraged to come early as the lines can stretch along the top of the fortification and down the narrow winding castle stairs. Could this be the reason the Irish have this reputation of having the gift of the gab? Hard to tell what the reason might be, possibly most of the population has kissed the Blarney Stone or could it be the fact that most of the population inhabits the pub most evenings and that the gift of the gab comes from nothing like kissing a stone but the "spirits" imbibed. Just saying! The whole endeavor to kiss this amazing stone is not easy! 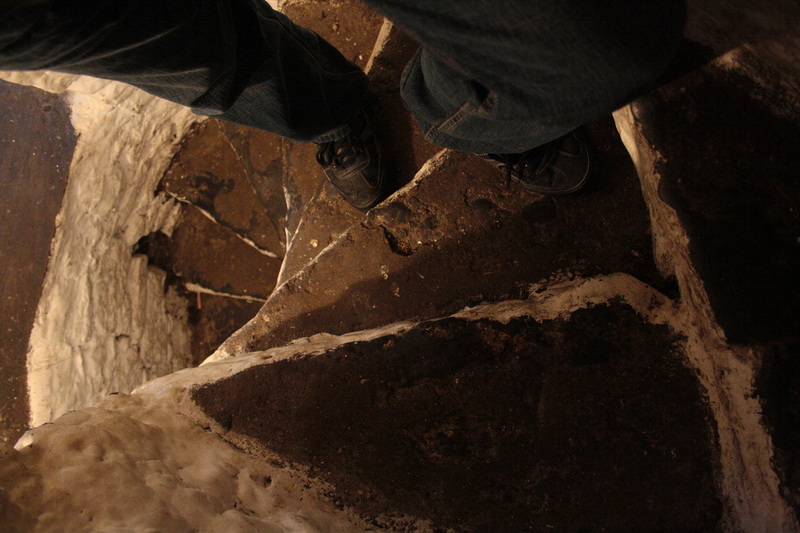 You have to climb a lot of stairs to the very top of the castle itself. They did not have elevators in those days, and have not been included in the renovation plans of them either. Above you see some of the stairs you will need to climb. If you have any claustrophobic issues, you have to leave them behind. You will have to climb to the very top of the wall, past the "Great Hall", the Earl's bedroom, and the Young Ladies room. Finally you will reach the very top of the wall, on the right you see Larry walking towards the far wall ahead and in the center of that is the stone that will release your tongue. You will be able to deal with any social situation once you kiss this stone. Amazing! But, the difficulties are not yet over. Now you have to actually kiss the stone! So how hard could that be you ask...let me explain. Let's analyze the photo above. 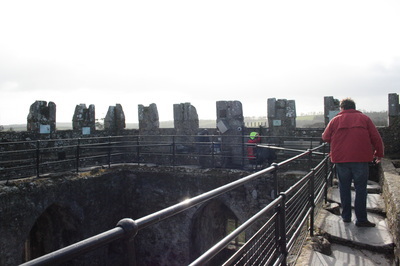 The stone you kiss is on the lower section of the upright wall between the two vertical parallel black metal hand holding bars you see in front on the person with the red jacket. Also, you need to know there is a gap between the wall the cameraman is standing on and that upright wall we just spoke about. The stone you kiss is below the level of the surface of this wall you see the cameraman standing on. Here is what you have to do....you sit down facing away from the upright wall, between the two bars. You lean back, lying down on your back. You grab the two upright bars you see for support and wiggle yourself over the open space hundreds of feet above the ground, towards the upright wall. Meanwhile the staffer sitting there will be holding on to you so you don't fall through this gap as you lean your head back and down to kiss this stone with your face in an upside down position. I know, it looks scary and dangerous but there are bars in place to keep you from falling, nevertheless it can be frightening, and you can lose a lot of loose change as you are actually, to some degree, upside down as you kiss the stone. The safety bars will not catch your money, and with your head facing the stone in an upside down position, you won't even see your cash sail through the air and disappear! Another way you can lose some change here is due to that camera you see above the head of the seated figure with his back to you. When you make your way back to the ground floor they will show you kissing the stone and you will be tempted to purchase it as a record of the rest of your life proceeding from this point with the gift of the gab. Below is a photo from the outside of the wall showing the gap as some other poor soul is leaning over and kissing the stone. I forgot to check the grass below this section of the wall, probably would have found all kinds of change from around the world. may be the sincerest form of flattery." 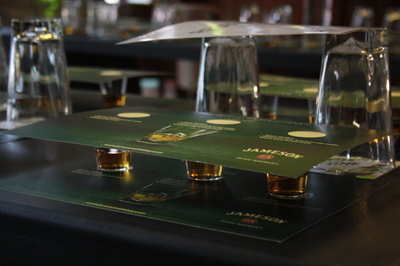 Irish Whiskey, the Jameson Way! on the waterfront at Waterford, Ireland. The women at the reservation desk looked at us two scruffy touristy guys rather weirdly when we arrived first thing in the morning, standing at their counter asking for a tour of their Crystal making operation. Of course, we ourselves were doubting our sanity, asking for a tour at a place of such finery. 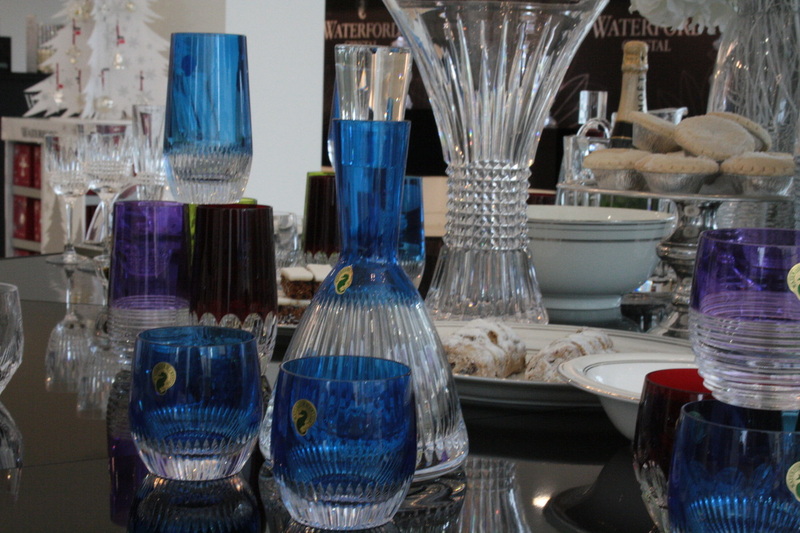 We'd already seen the display of amazing crystal table ware and wondered what we were doing here ourselves. But, it had already been scheduled and paid for, and so here we were, ready to endure the embarrassment and go through with it. Well, it turned out better than we thought. If fact, the process followed my own creative specialty of working with clay creating ceramic sculptures. 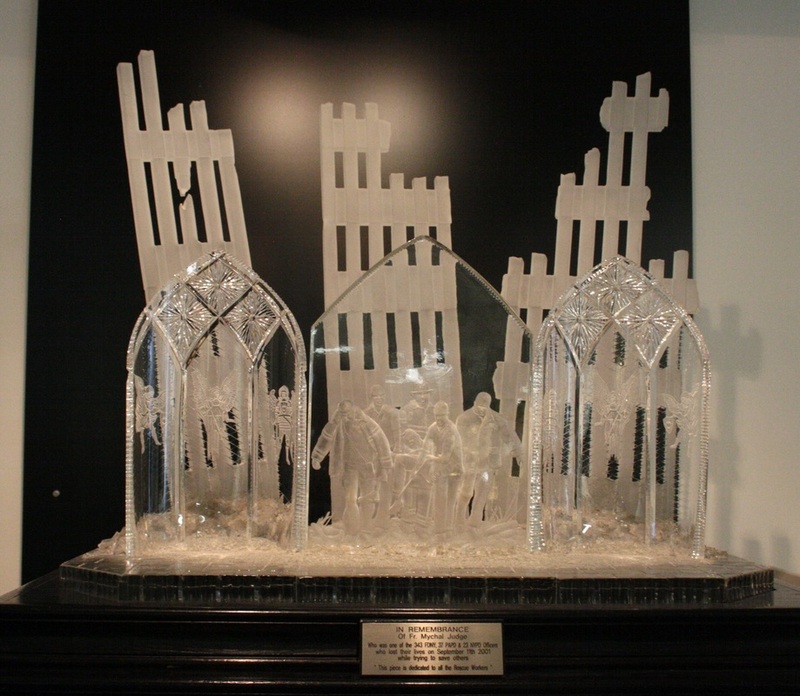 Another subject which came up during the tour was regarding the fact that only men were working in the warehouse creating the crystal. Our tour leader had no answer for this and so it was kind of left hanging in the air. But, we felt more comfortable of course. After we finished the tour, another problem arose. We were wondering around the obligatory "you have to buy something after a tour shop" when we realized something scary for guys. Our wives would most likely be expected us to bring something home from this establishment in the form of a gift. Something from a castle would not be so appreciated, but this probably would. Upon careful reflection it seemed like a no brainier, we were stuck, trapped and helpless, it had to be done, we had to buy something! But what in the world could we afford from a place such as this? The staff must have been wondering about us as we went around the store displays again and again, peering at euro prices and straining our brains with calculations of Canadian dollars. We finally landed on a solution, it would have to be Christmas ornaments! Yes that's right, that's all we could afford and still keep the respect of our ladies back home. If we'd spent to much or to little, we would just have to ask for forgiveness later! Meanwhile, we had to get on the road. 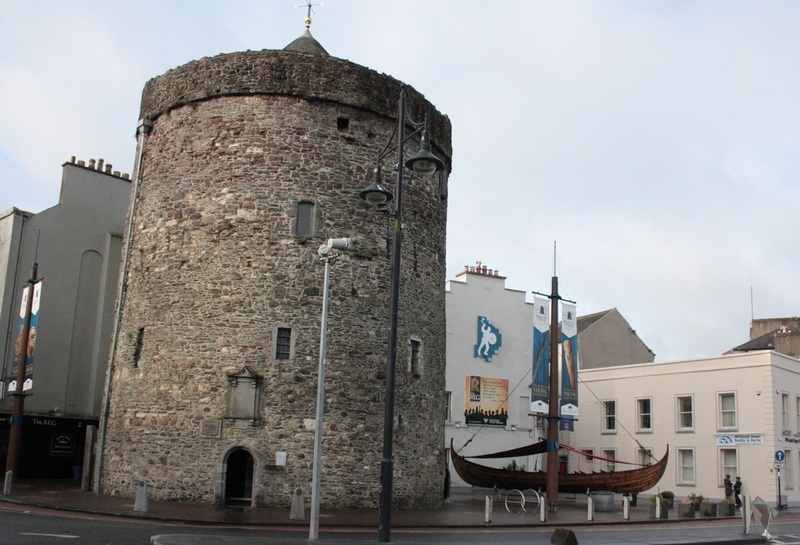 Waterford was tempting with all the Viking and medieval stuff we could explore. We decided if we ever came again, we'd do that then. 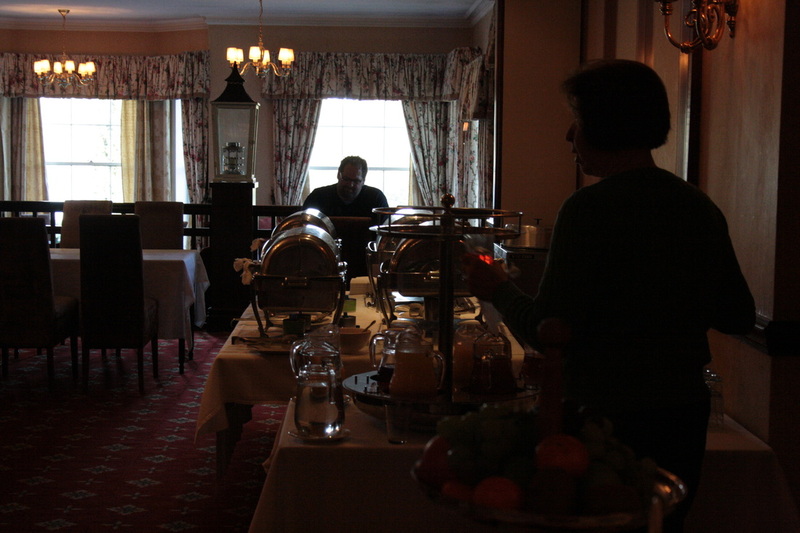 For now, we had a schedule which meant driving 140 km to our next tour event and our B&B for tonight. 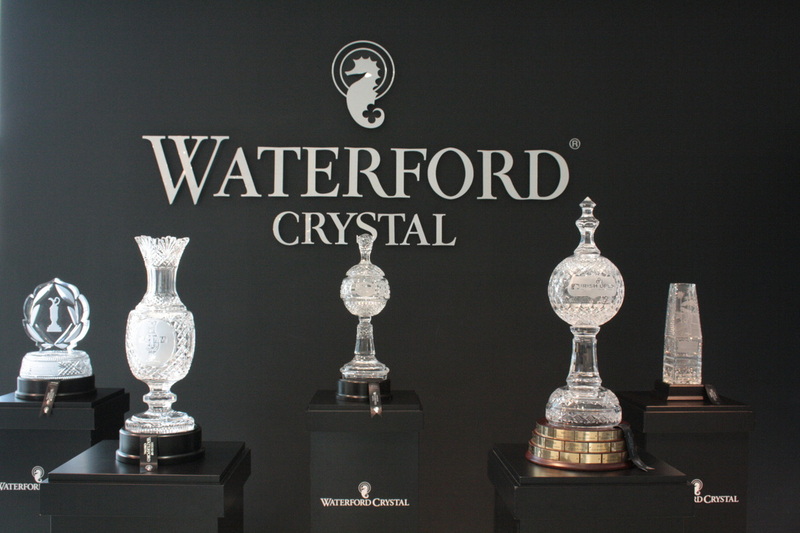 The Whisky distillery is located about 100 km from Waterford just north of Midleton. 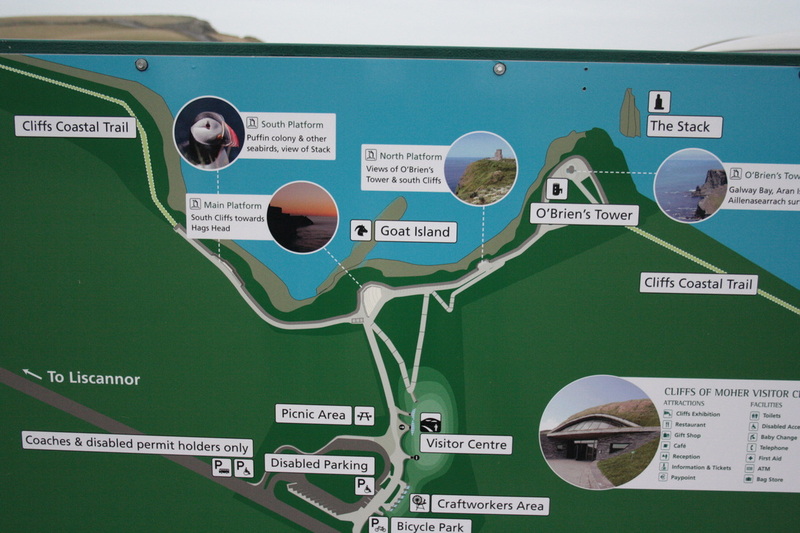 Below you see a map with the two locations and on the right a photo of the amazing countryside along the way. 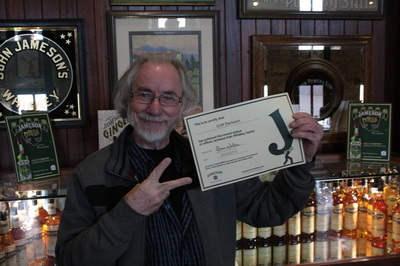 We arrived at the Jameson Distillery just in time to join a tour that had just begun. Above is an old pot-still outside the entrance and below is what used to be the power source for the whole plant, a huge cast Iron waterwheel. This waterwheel dates back to 1852 is 22 feet in diameter and is made of cast iron metal. 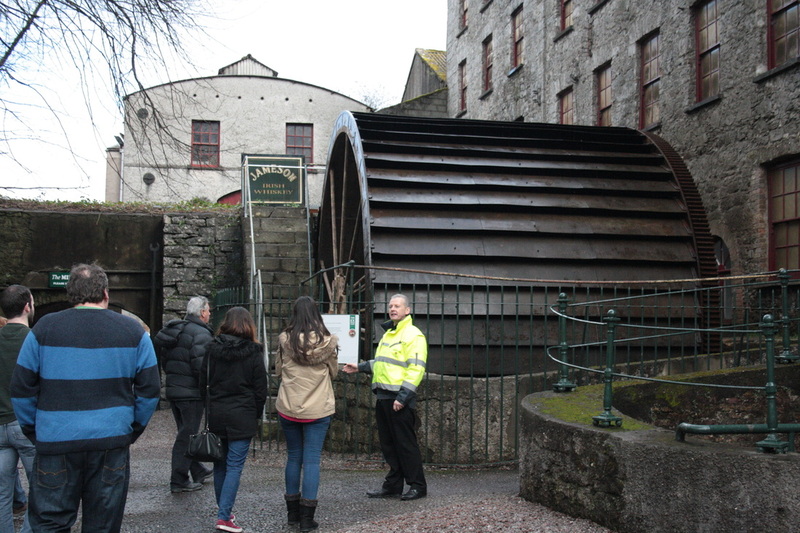 It is one of the few waterwheels working in Ireland today. It drove five sets of millstones which ground down the malt and barley into a course flour called grist. 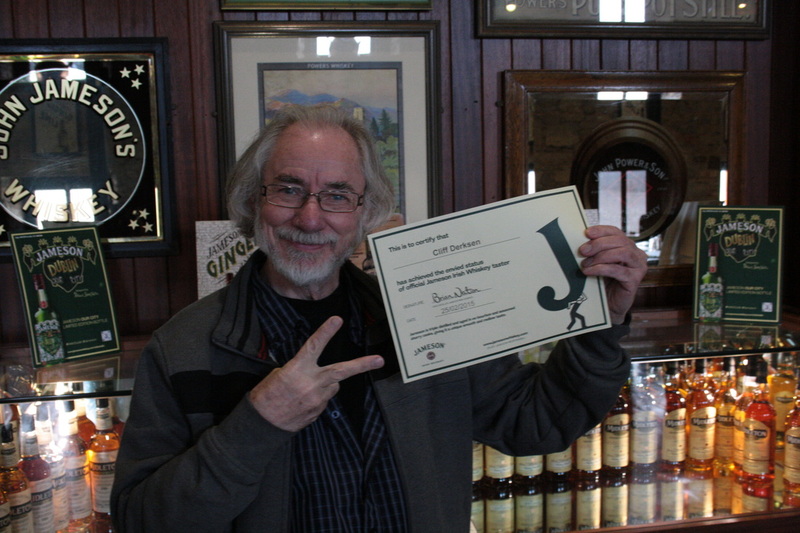 There are two unique aspects of Jameson Irish Whiskey. First it is in the way the sprouted malt is dried. The guide took pains to clarify that it is dried in a kiln using a smokeless heat. Away from direct heat. While their neighbors in Scotland blow peat smoke through the grain giving the Scotch whisky a smokey peaty taste. This taste is deliberately absent in Irish whiskey. The second reason is illustrated in the photo below left. 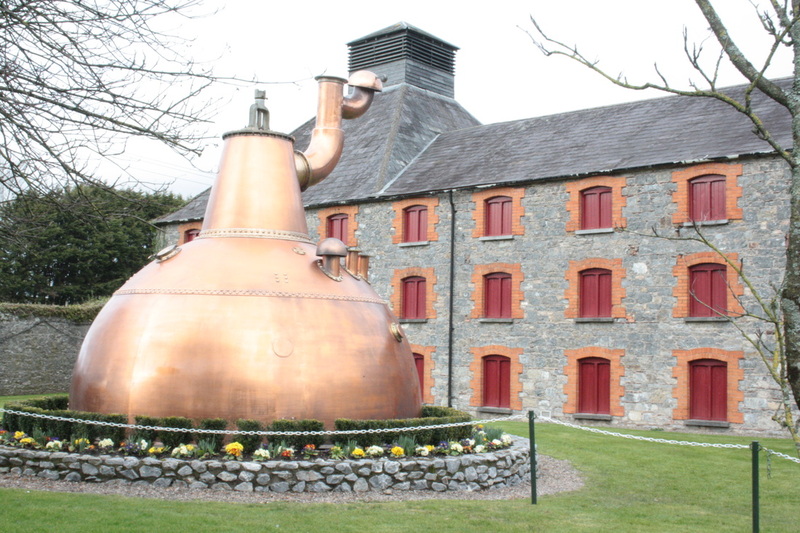 Irish Whiskey is distilled three times. Scottish whiskey is distilled twice and American once. 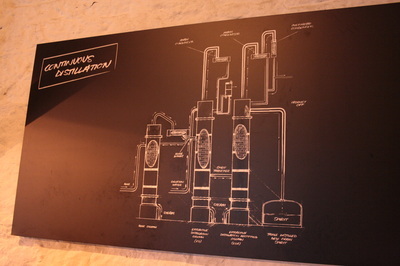 The illustration below shows three distillation units connected together, where the "wash" is introduced on the left, boiled and it's alcohol vapors cooled or "distilled" then heated and cooled another two times. 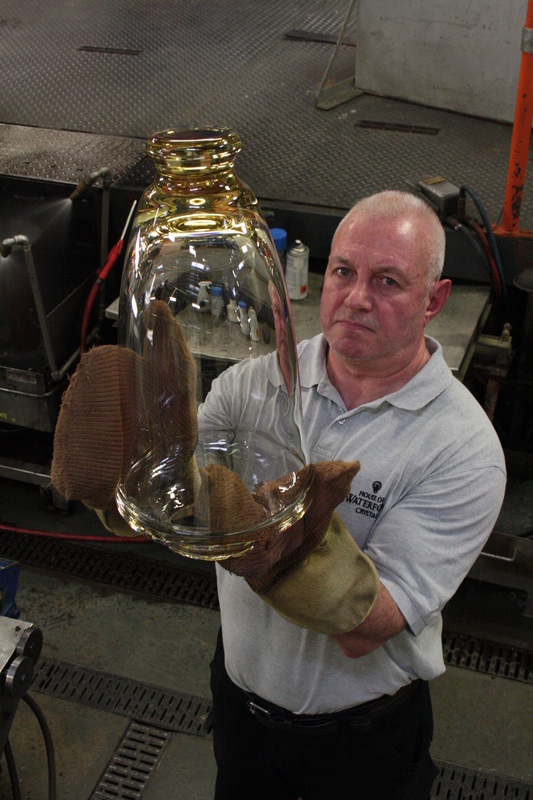 The resulting "spirit" is very pure at around 96% alcohol. At this point it is virtually colorless and odorless and does not become whiskey until it has spent at least 3 - 18 years maturing in oak barrels. During this maturation process the whiskey develops its rich golden color. The kinds of barrels and the number of years stored result in the different types of whiskey sold. 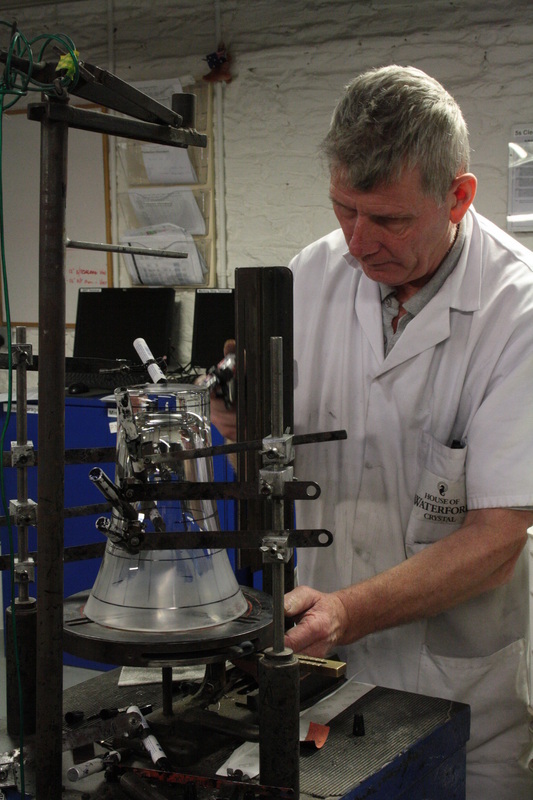 Before bottling it is reduced to an alcoholic strength of 40% ready for consumption. At the end of the tour we were ushered into the bar area to do a taste test! In the above photo you will see that on the left was a sample of the Scottish (smokey tasting) whiskey. 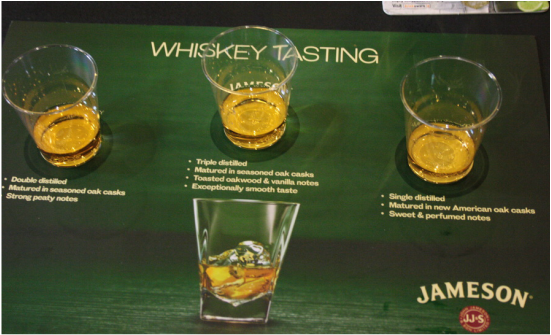 On the right was an American whisky and in the center was the Irish Jameson whiskey. This was very enlightening as the differences were dramatic. The Scottish was very tart with the smokey taste and the American very bland, while the Jameson in the center came out smooth and pleasant to the taste. 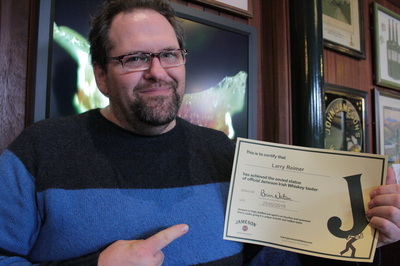 We were of course each given a certificate as taste testing experts and served a wonderful glass of whiskey at the bar. What a way to end the day! Now all we had to do was drive on to Blarney north of Cork and find our B&B! 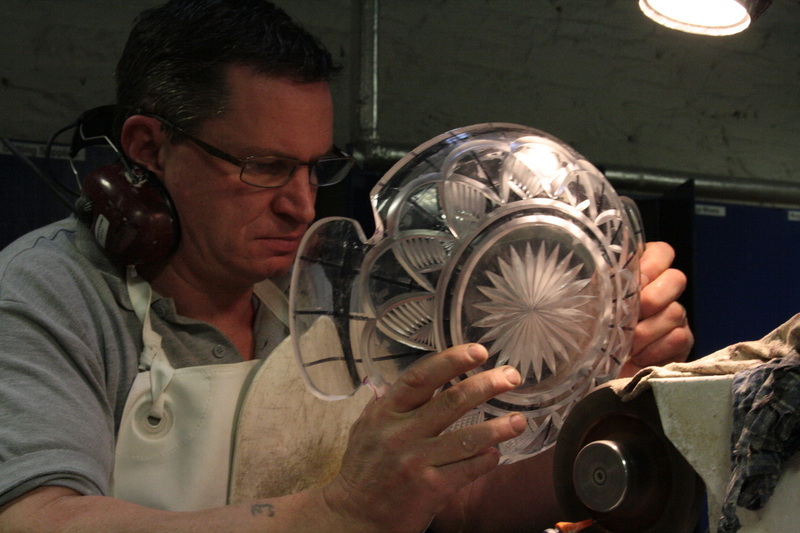 In fact, they make 50,000 pieces per year. As you can see, by these photo's the artists and designers love a challenge and will attempt to replicate the strangest things. 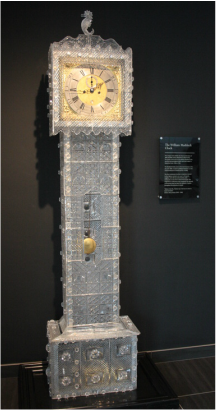 The Grandfather clock you see above is not for sale as it is considered priceless. But, said our tour-guide, for insurance purposes it's valued at $150,000 euros. 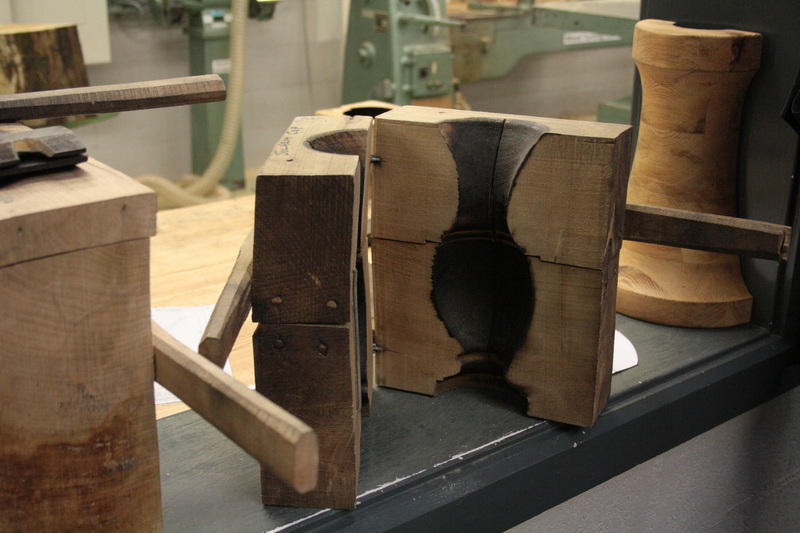 It all begins with a wooden mold good for only 10 pieces. 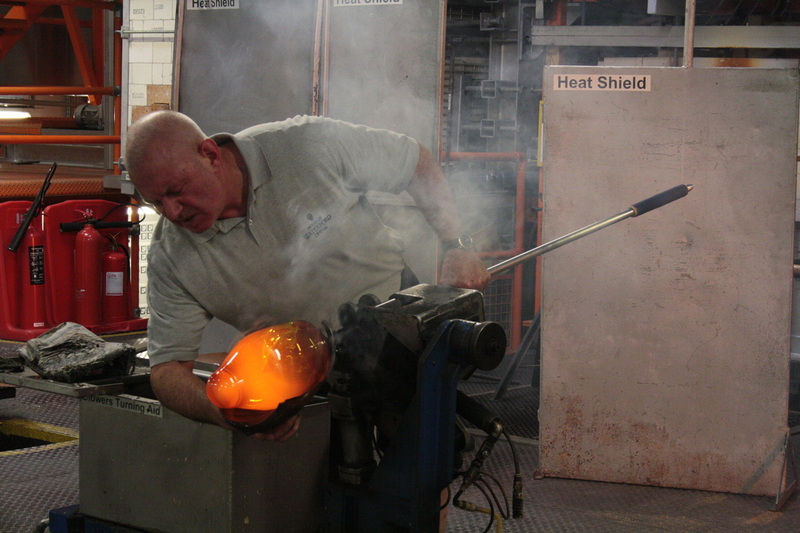 Then the technician grabs a glob of molten glass on the end of a hollow pipe and lowers it into the mold and begins to blow...making it hollow and filling the form of the mold. In short order it cools, is removed from the mold and cut to separate from the blowing tube. You see the results below. Then the process of sanding, and bringing it on through the shop to completion begins. 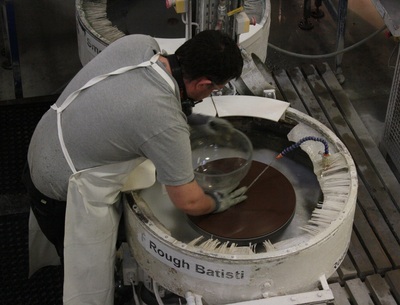 Here are some photos of the process. Here is a glass cutter, following the designers pattern on the bowel free-hand! It was just amazing to watch. 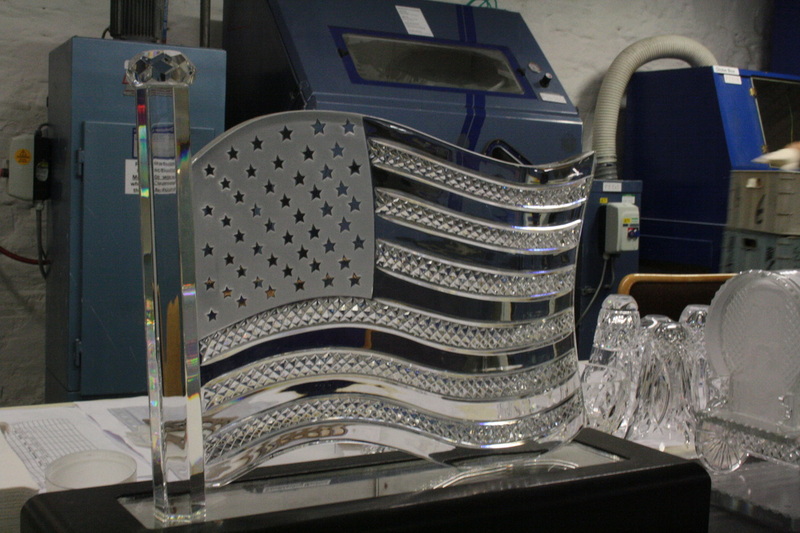 Below is an American Flag in process. Below the flag you see a viking ship in the making. 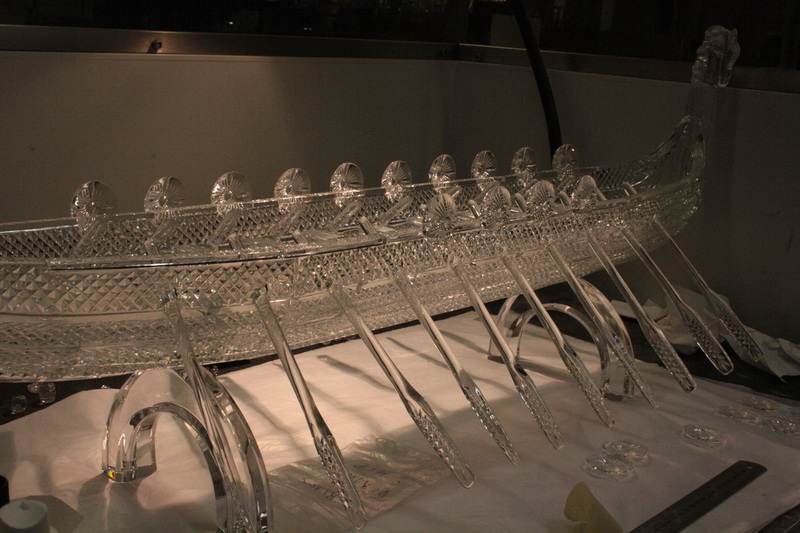 It will include a glass sail! Here is a photo of Larry with our tour guide who did an excellent job explaining what happens in the crystal factory. Below I will conclude with a few more photos including one in memory of "9-11". Date: Feb. 23, '15, Tuesday. 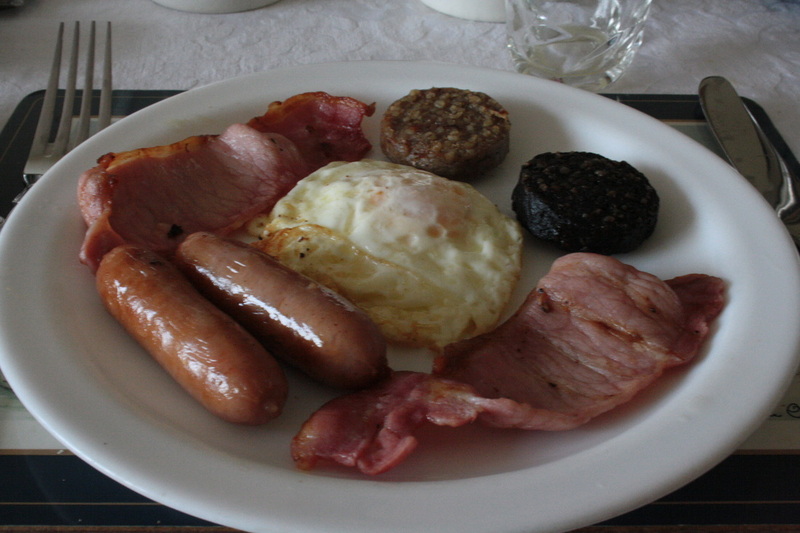 Larry and I are enjoying an amazing buffet breakfast at the Noremore Hotel and Country Club. This will be a photo journal of our first full day in Ireland. 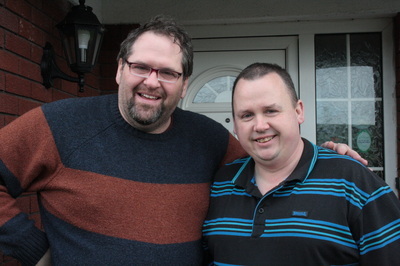 We had just enjoyed a great afternoon and night of recuperation and were ready to start our day's adventure!. Below are a few shots of the place, the entrance and the crocuses making an appearance in of all things the month of February. The country club is located one hour north of Dublin. 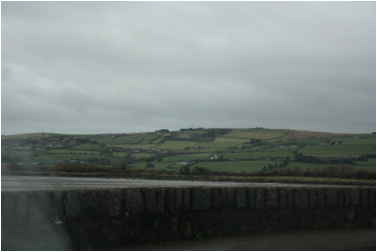 Today we would leave here and drive to Kilkenny, which due to some learning about how Ireland maps their country, took us about three hours to make our way there. Probably about an hour or so more than normal. When we got to our B&B, we realized we were only a 12 minute walk from the Castle and the reconstructed medieval village that went with it. So it became a walking tour. We did need the exerciser. The Earl William Marshall owned large estates in Ireland, England, Wales and France and managed them effectively. 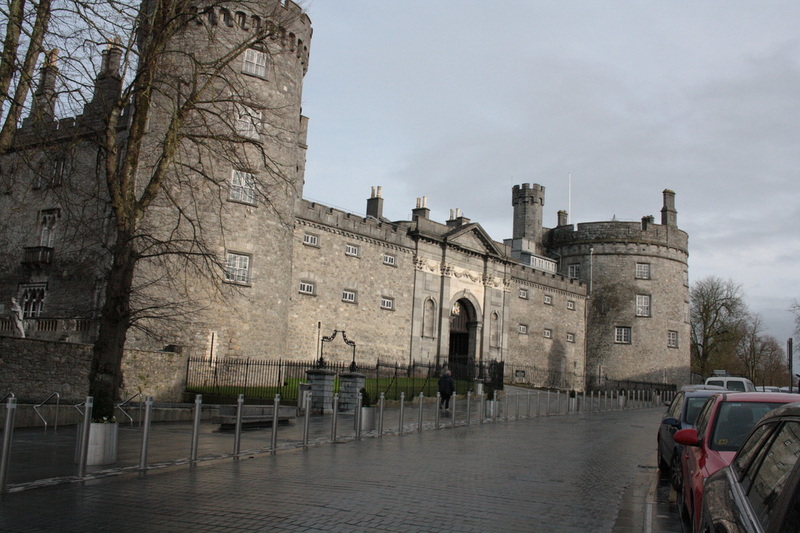 He began a major phase of development in Kilkenny, including the construction of Kilkenny Castle and the agreement of rents and privileges with burgesses or citizens of the borough. The first stone castle on the site, was completed in 1213. 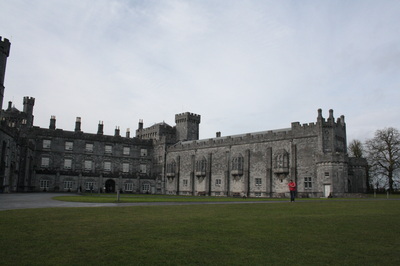 This was a square-shaped castle with towers at each corner; three of these original four towers survive to this day. James Butler, 3rd Earl of Ormonde bought the castle in 1391 and established himself as ruler of the area.﻿ This began the "Butler Dynasy which rulled the area of centuries lasting over 500 years. They were the Earls, Marquesses and Dukes of Ormonde. One Lady Margaret Butler, born in this castle was the paternal grandmother of Anny Boleyn, who you may remember as the second wife of King Henry V111 of England. The Castle became the seat of power and was the venue for the meeting of the General Assembly or parliament of the Confederate Ireland government in the 1640s. The Butler family lived there till 1935 when they abandoned it and moved to London. In 1967, Arthur Butler, 6th Marquess and 24th Earl of Ormonde, sold the abandoned and deteriorating castle to the Castle Restoration Committee for £50, It has been refurbished and is now a great place to see, we loved the tour. given up their's upon entry, but not him! The art gallery was a real surprise and jaw dropper as we walked into this huge castle wing dedicated to all these paintings. We were very impressed. 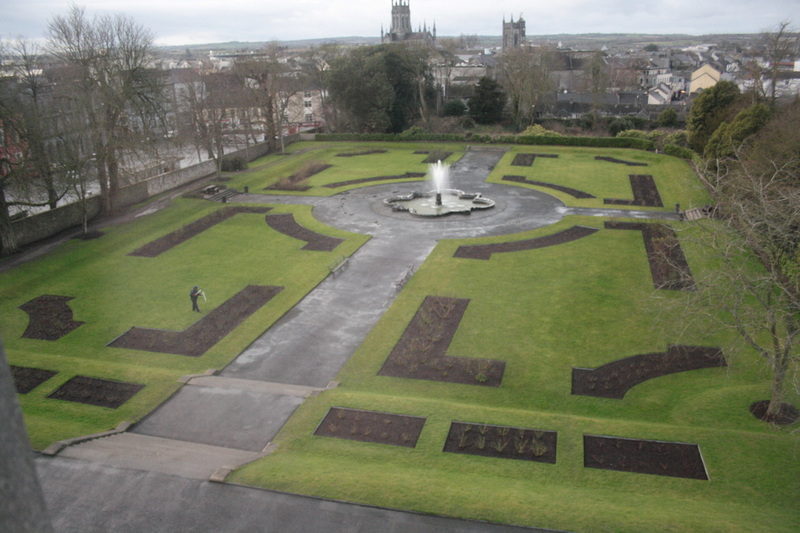 Below is a picture of the castle garden from one of the upper windows. 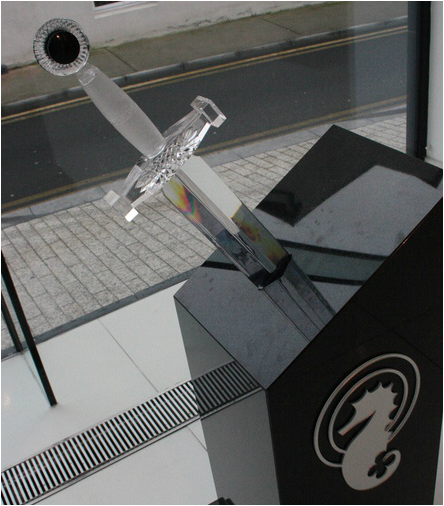 Notice that it is in the shape of a Celtic cross. You can tell it's spring, plants are just emerging or being planted. We were not allowed to take photos inside the castle but here are some I took as I walked around the outside to the left. So you can see where the eastern wall used to stand, but what happened? How did it disappear? 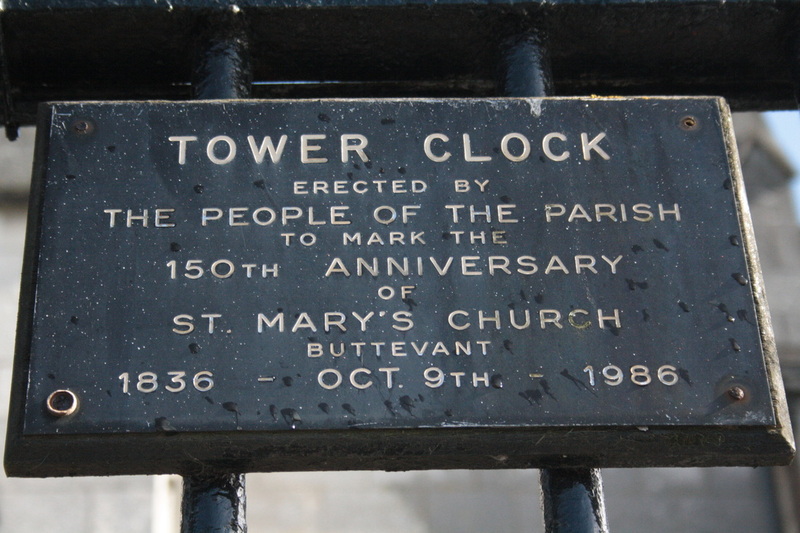 Well, to put it simply and plainly it and the North-Eastern tower were blown to bits during the 1650 Cromwellian very bloody siege of Ireland. Even though the Butlers were protestant, it was his way of symbolically saying I'm in charge and taking over the Irish government which was meeting there at the time. After this we walked around the village area built in the form of the original medieval style of crooked narrow streets. 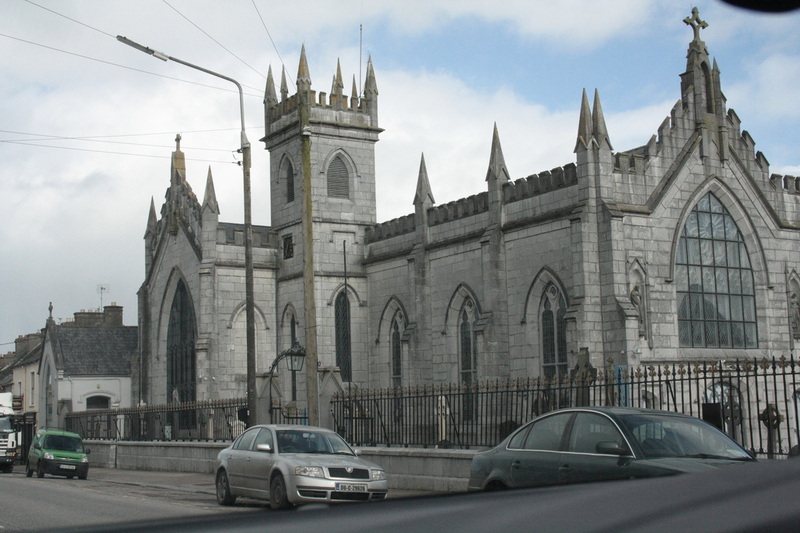 The Church on the right below is St. Canice's Cathedral. Unfortunately, we stayed too long at the castle so by the time we got here it was closed. If you are ever planning a trip check out http://www.visitkilkenny.ie/tynans_walking_tours and other websites which explain the amenaties of Kilkenny. 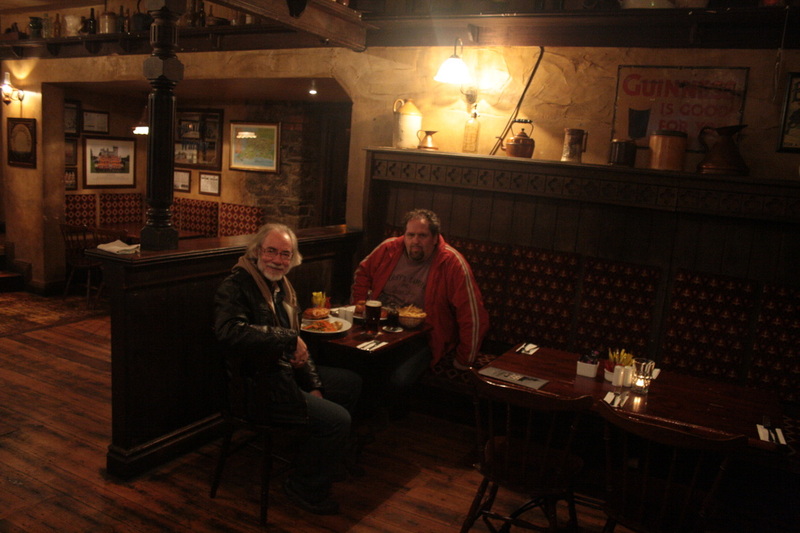 After our self guided tour through the town we stopped for supper at the pub, Kytelers Inn. On the left is our view of the bar from our table. 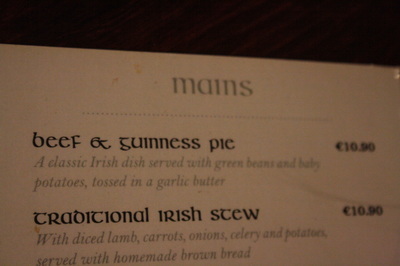 We enjoyed a great meal here, I had some great Irish stew. After that we walked back home to our B&B for a good nights sleep. 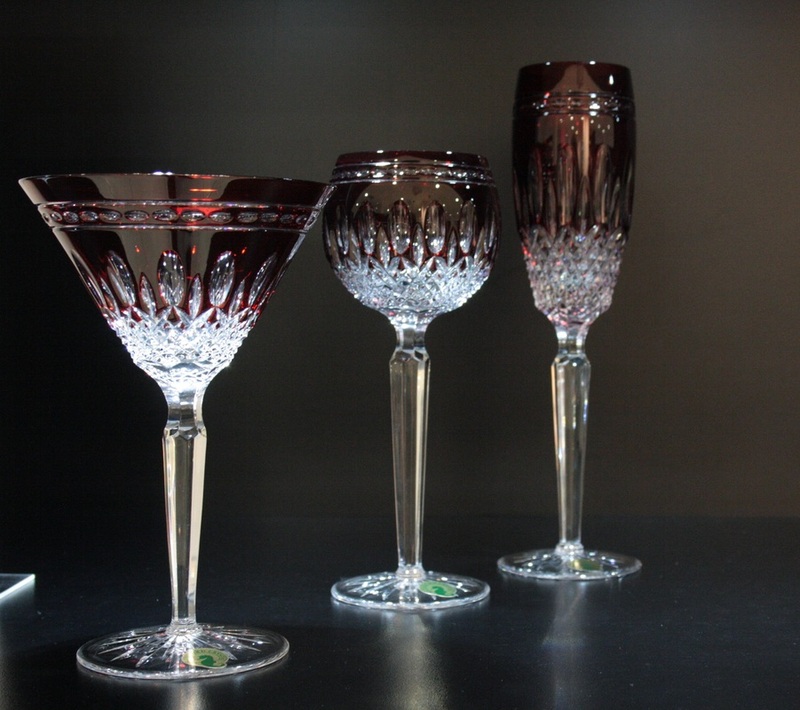 Tomorrow, it's all about making Crystal! Nuremore Hotel and Country Club. The flight over from Chicago to Dublin was uneventful except for one aspect, we did not sleep well on the plane. With all that excitement we forgot that the flight would only be a six hours in length! The plane left at 7:15 pm, great we thought for a good nights sleep and we would hit Ireland with gusto. We we on adrenalin getting into the plane. First of all, there was a supper to be had! By the time that was over an hour was gone. Then, we had a movie screen in front of us, well, we thought, let's watch a movie! airplane were totally helpless and out of control. Two moves later we began to think about tomorrow and, oh right, we should get some sleep. Well by the time we'd reclined our chairs and adjusted our pillows we were about thee quarters of an hour from our 9am landing in Dublin, Ireland! As we exited the airport we stopped in at the Dan Dooley Car Rental counter and rented the car that was to take these two innocent lambs for a holiday tour of Ireland! They never saw it coming. At the rental lot, the agent was very helpful, dispensing all kinds of advice regarding the vehicle, how to handle driving on the left side of the road, "Don't drive onto the right side at all as long as you drive this, our car!" etc. He told us where to go to get onto the road to our first hotel and everything. I don't think we heard a word! We were so excited to get going...like wild horses in the racing chutes, scared as all get-out, yet eager to take off in all directions! on a narrow one-way road that seemed to be taking us back in the direction of the airport. In not time it was to long to back up on...What? Plus we could not turn around, pull over or even check a map. In two minutes we found ourselves approaching a parkade entrance gate which would open only if we claimed a ticket. We stopped and considered our situation, and not too calmly! The pressure was on. We had no choice! We pushed the cursed button and pulled a ticket out of the dreaded machine. The arm lifted and we drove into the parkade area looking desperately for an exit route! Which we did eventually find. 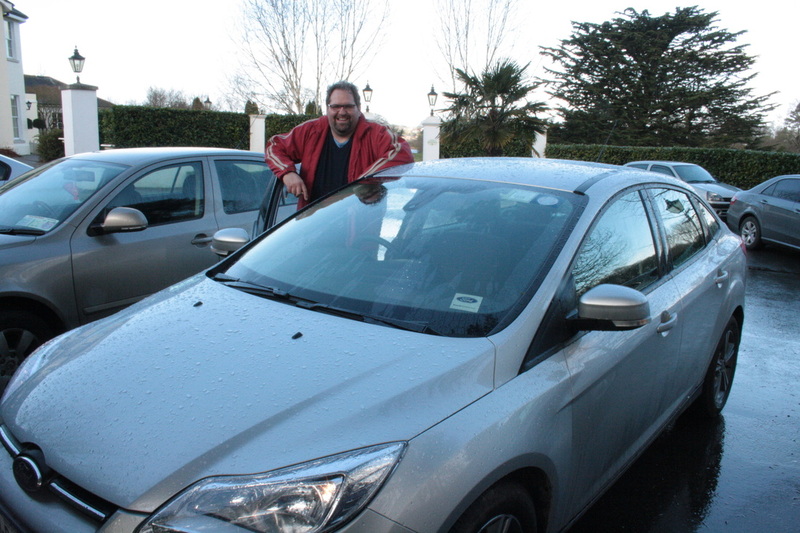 Here is our driver, Larry with our European 2014 Ford. Standing on the "Drivers side of the vehicle"! amount of parking tickets throughout our journey through Ireland! This driving on the left side of the road could become expensive! When we got to the exit, we pushed in our ticket and surprise! The arm blocking our way lifted without demanding Euros! God is good! I think the staff at the Country Club could see how exhausted we were and asked us immediately if we would like a coffee or tea. "Oh yes..." we were ready. The rest of the day, we slept and recuperated for the next day of driving, much more aware of the impact traveling on the left side of the road would be on both the driver and the navigator. you are in the wrong lane. We, Larry and I (Cliff) are going to Ireland! Join the adventure of our personal discovery of this magical island.